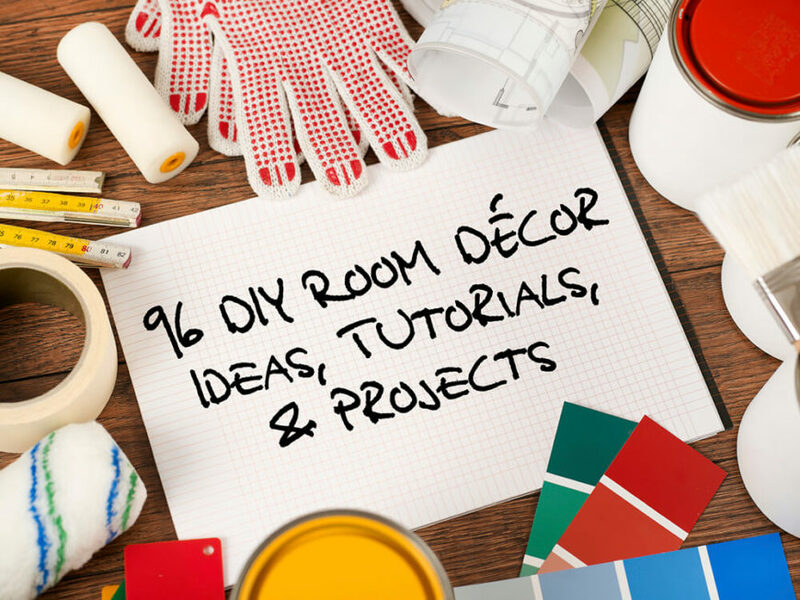 96 DIY Room Décor Ideas to Liven Up Your Home! Welcome to our epic guide to incredible do-it-yourself projects to make and furnish your home with! This guide will cover all sorts of projects, from larger furniture to small, simple kid-friendly projects to decorate a child or teenager’s room with. There are difficult projects and beginner projects sorted into all kinds of design styles, room types, and even by material! We’ve also included some of the original YouTube tutorials to help you get a headstart. These projects are proof that you don’t need to spend a ton of money to spruce up your home. We’ve also included material lists to help you decide if the project is right for you. Even small changes can make a world of difference in your home, so we’ve assembled a lot of projects that focus on taking everyday objects and transforming them into beautiful new objects, or making small changes to existing parts of your home to go from builder’s grade to upgrade! So whether you’re looking for dorm décor or an easy, inexpensive way to build a brand new headboard, we’re sure you’ll find a project worth doing! 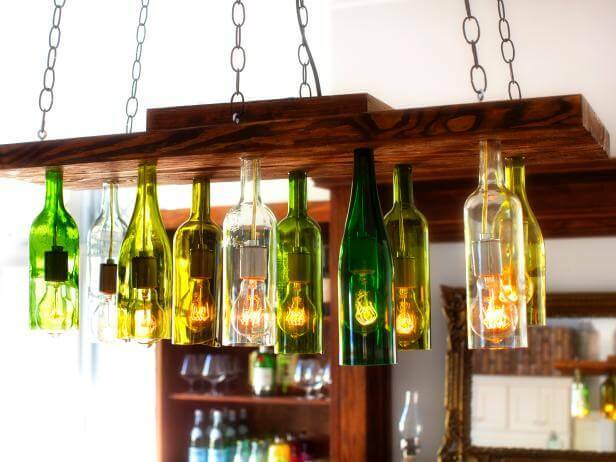 Build a new chandelier out of wine bottles, or recycle a pallet into a coffee table. Get creative! So let’s take a look at some incredible projects from some very creative bloggers and get inspired to craft. We hope you’ll love these crafts creating amazing décor ideas as much as we do. 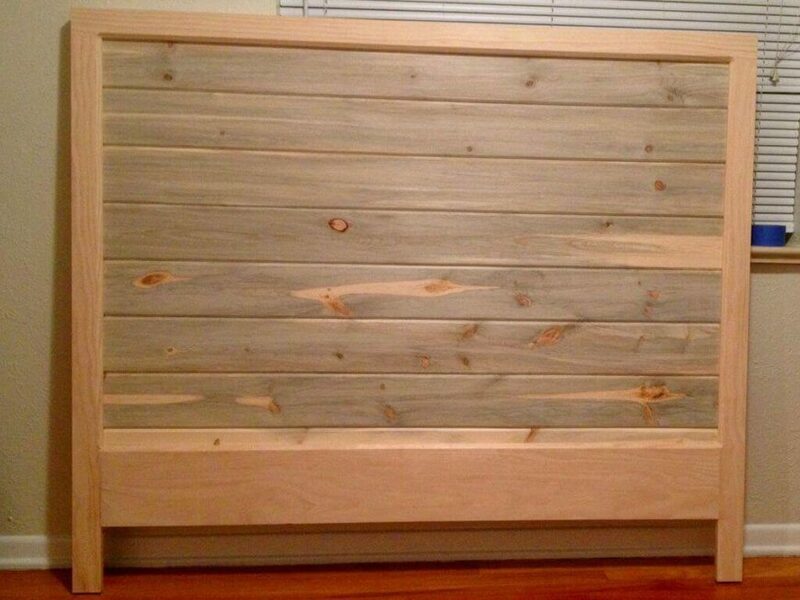 This is a great project that will result in a lovely wooden headboard that you can stain or paint to match your current décor. While the headboard is made of pine, it can easily be stained to a darker walnut that would fit perfectly with other antique furniture seamlessly. Check out the full tutorial at Instructables! This is a totally unique ceiling light that combines the classic feel of a plaster ceiling medallion with a more industrial metal chandelier. This is a harder one, but the customization options available to you with this project are excellent. Check out the full tutorial at Batchelor’s Way! 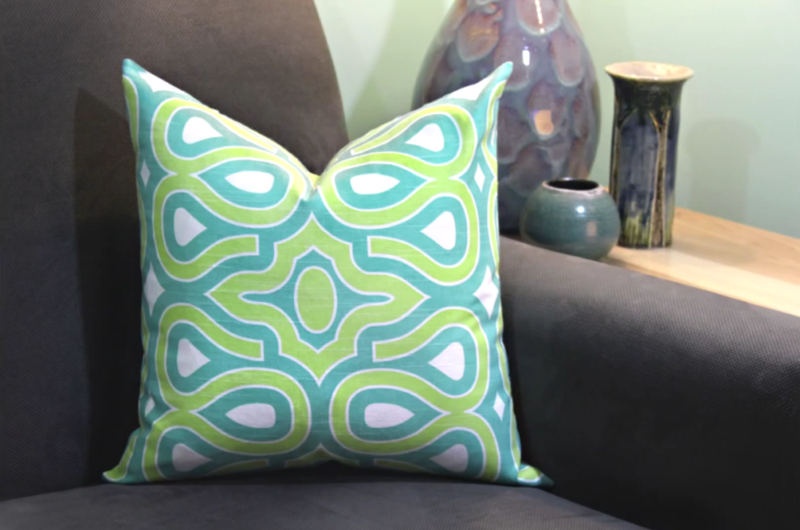 This awesome and easy video tutorial will have you sewing throw pillows for your bedroom that will keep your design fresh. 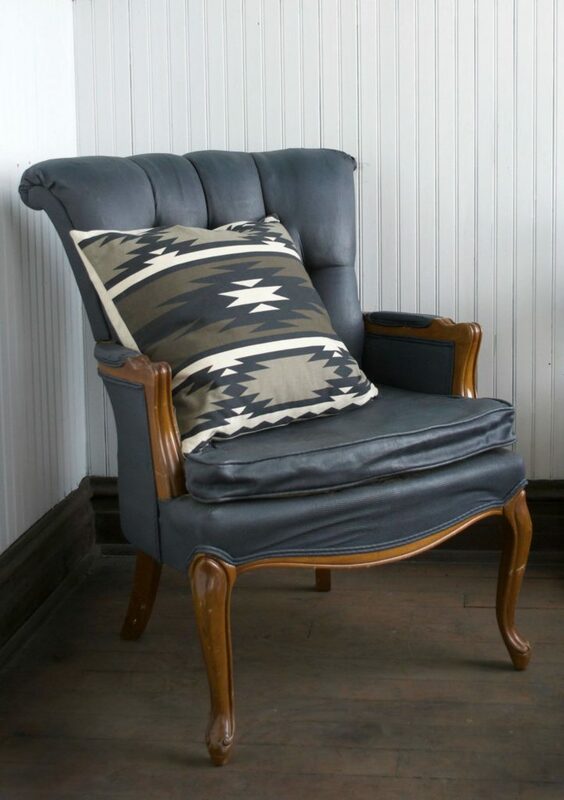 Learning to sew your own throw pillows is a great cost-saver, since store-bought pillows can be incredibly expensive. Better yet, you won’t have to worry about finding that perfect pillow; you can just make it! 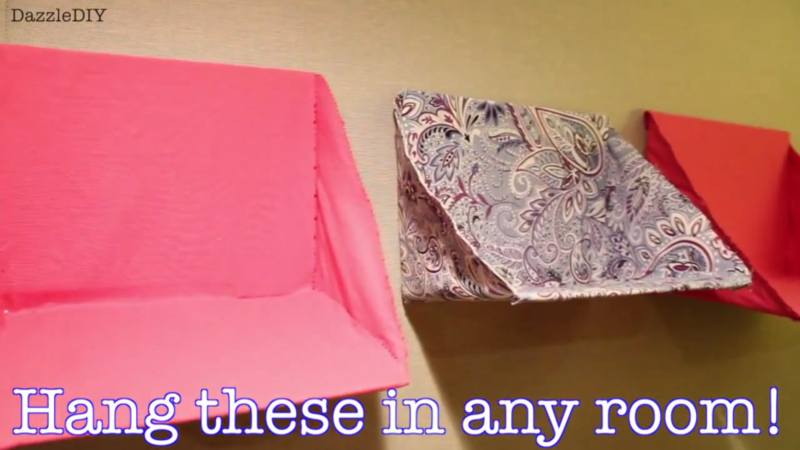 Check out the full tutorial from Online Fabric Store! This adorable bit of wall art combines a sweet saying with a string-art heart and is perfect for pretty much any style home. This is an easy option that is perfect for your own home, or as a gift for family or friends. Check out the full tutorial from Simply Handmade! Building matching nightstands has never been so easy! 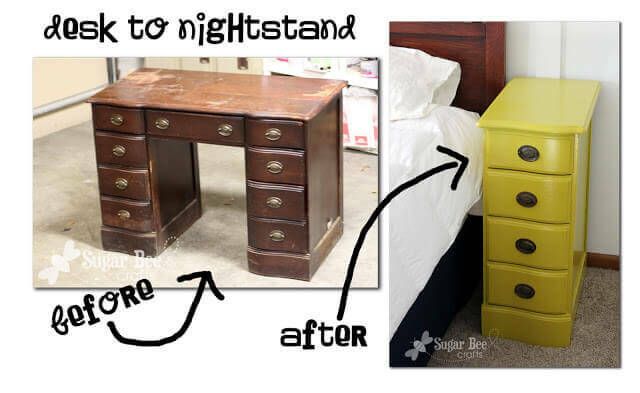 This is a great way to repurpose an old desk and get matching nightstands. Paint or stain the wood to get the right color or style for your current décor. Check out the full tutorial at Sugar Bee Crafts! Terrariums are a great green addition to any living room, and they are fairly easy to take care of, so even if you don’t have a green thumb, a terrarium is a great choice. 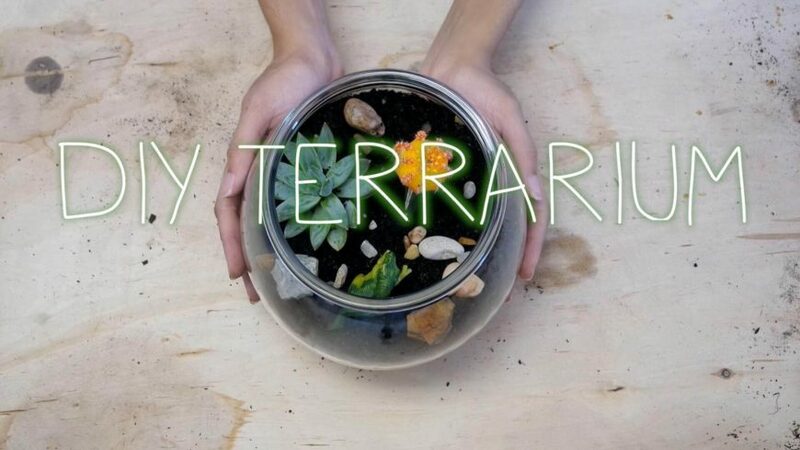 This tutorial will help you design and create your own unique terrarium. This is a great project to do with friends or with kids too! Creating a gallery wall is a great way to fill a wall in a living room, particularly when that wall is above a console table or behind a large sofa. 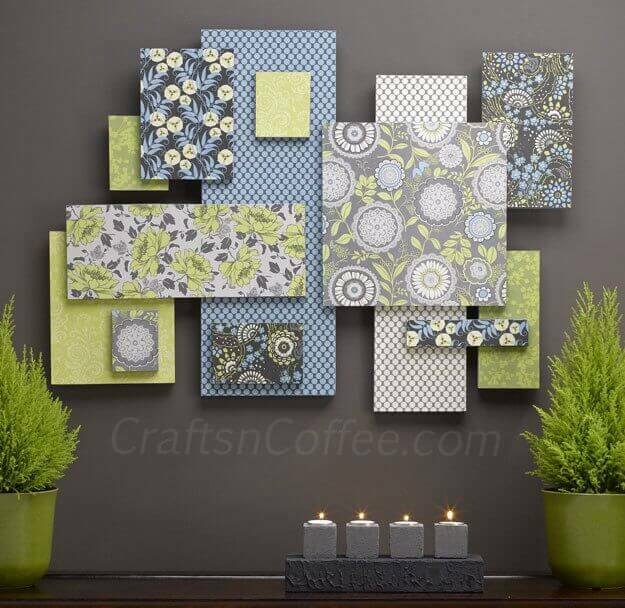 This will show you how to create a gallery wall using a color palette and a variety of patterns. Layering the pieces of the gallery wall creates incredible texture and volume. Check out the full tutorial from Crafts ‘n’ Coffee! Floating corner shelving is welcome in basically any room in the house, but nowhere is it more useful than in a living or family room. This makes perfect use of a small corner by adding three tiers of floating shelving. Check out the full tutorial from April Wilkerson! Pallets are really versatile materials, and they can be acquired cheaply, or even for free! Creating your own pallet coffee table is fairly easy, and you can stain the wood to match your other furniture. 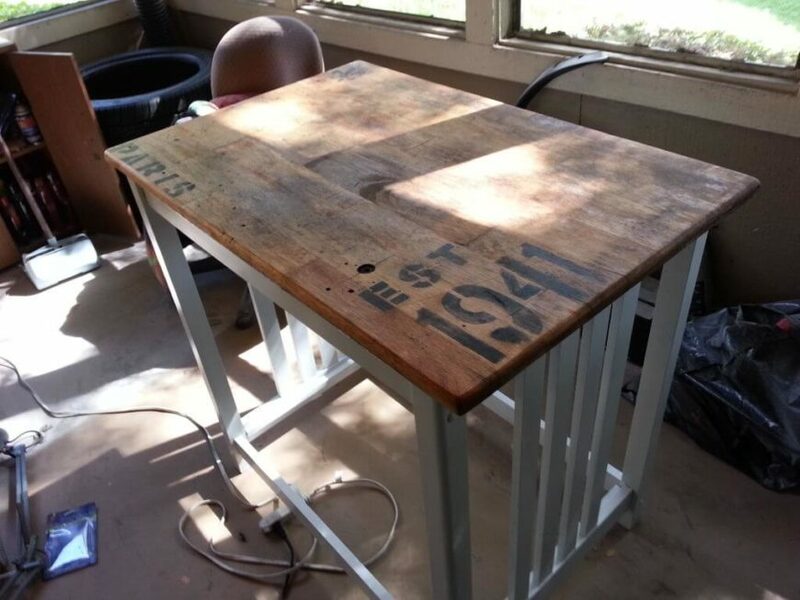 We love the way pallet tables look in most styles, including industrial, farmhouse, and even in contemporary spaces! 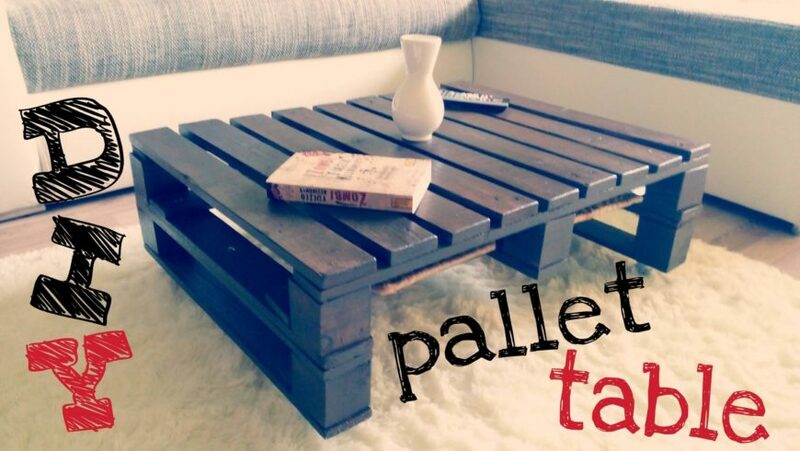 If you’re looking for cheap décor, look no further than pallet projects! Check out the full tutorial at Painty Cloud! These adorable floral throw pillows are super easy to make and leave a lasting impression on guests. They’ll never believe that you didn’t buy these pillows! These pillows would look best in a contemporary living room, or as part of a cute teen girl’s room ensemble! Check out the full tutorial at Anne Le! 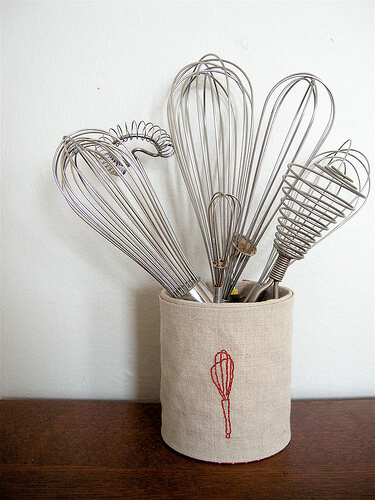 Need a little extra preparation space in your kitchen? This adorable island is small enough to rest in the center of your kitchen and provide a centralized preparation space. Even better, it’s on casters, so you can wheel it to wherever you need it! Check out the full tutorial from Build.com! 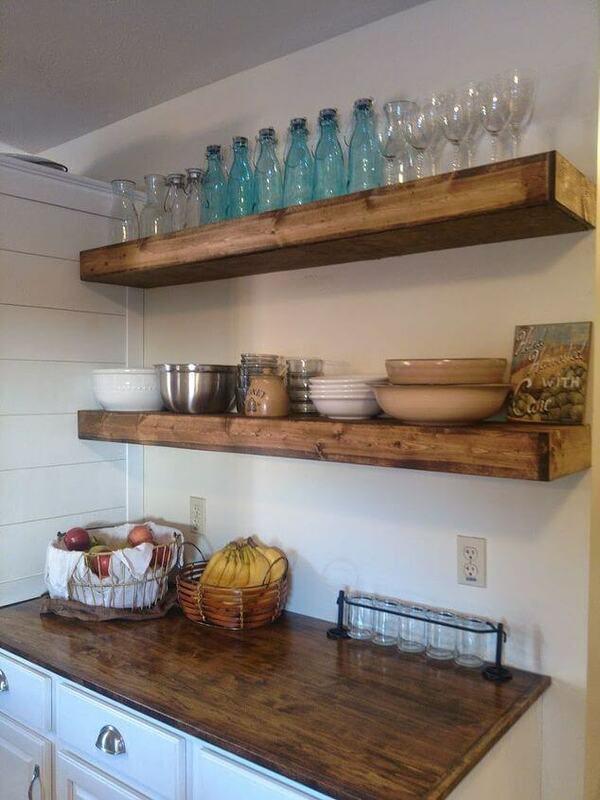 Floating open shelving is a popular look for rustic and farmhouse kitchens, and can be great for storing glassware and other, more attractive kitchen items. The good news is that they’re a fairly easy as well! Check out the full tutorial from Hometalk! Marble countertops are desirable, but the renovation process is expensive–not to mention the sheer cost of the stone itself. 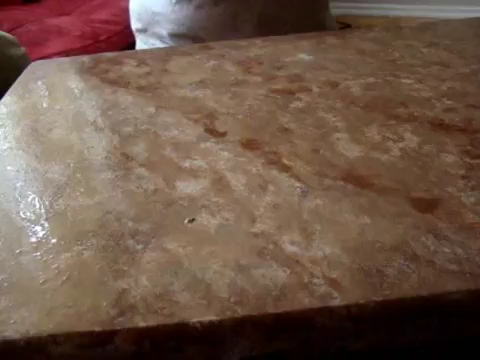 Some clever DIYers have found ways to get the coveted marble look without shelling out the cash! This video tutorial is the perfect way to find out if faux marble is the alternative option for you. Check out the full tutorial from Roula Nachabe! This is another great structure that can be built a little higher to form a high-top table for two, or shorter as an island. It utilizes antique reclaimed wood for a decidedly rustic aesthetic. Check out the full tutorial from Instructables! Finding space for a herb garden without creating unnecessary clutter in your kitchen can be difficult, particularly if you have a small kitchen area. Mounting small mason jars on the wall is a great way to take advantage of wall space for both decorative and practical purposes. Check out the full tutorial from Homes+ Magazine! This simple piece of wall art is an easy one that will make decorating your teenage boy’s room much easier. This is an easy project that they may even want to help out with! Check out the full tutorial from Joe Conza! While teen boys may no longer play with their childhood action figures, it doesn’t mean they really want to get rid of them. 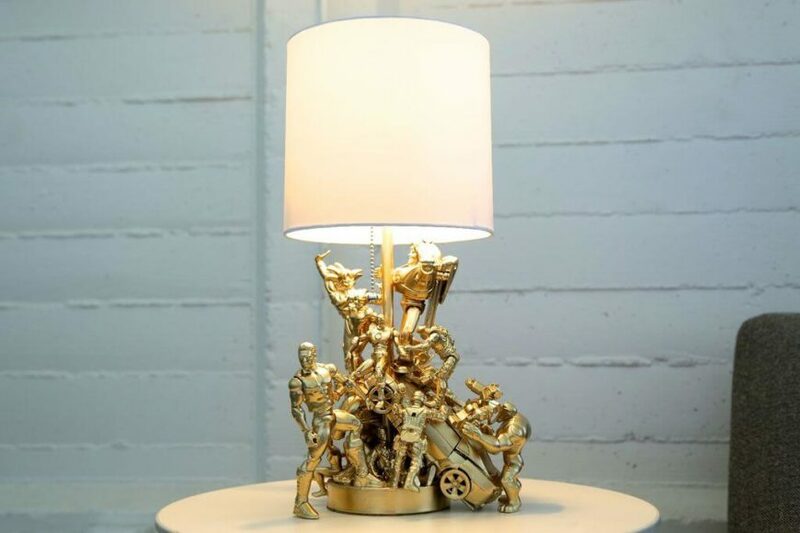 This is a clever way to repurpose favorite action figures into a grown-up lamp. Give it a shot! A simple wooden headboard is a great addition to any bedroom, but they especially work well in teenage boy rooms. They’re sturdy, classic, and are a piece they’ll want to take with them when they move out as adults. Check out the full tutorial from The Rehab Life! 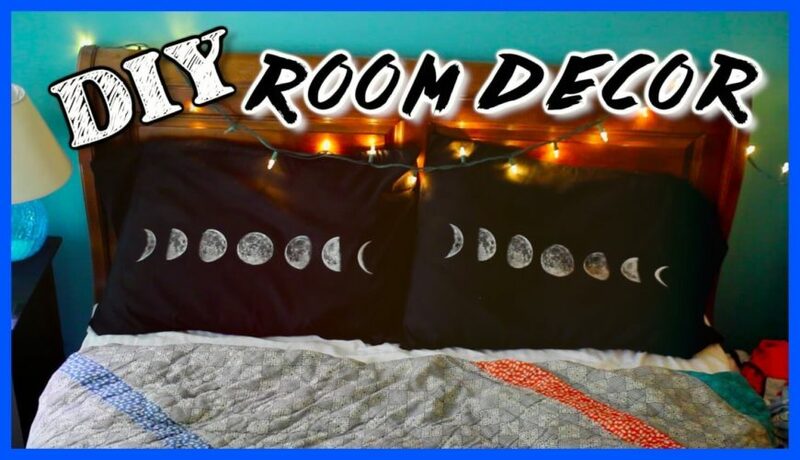 For the boy who loves outer space, these moon phase pillowcases are the perfect addition to the bedroom without seeming babyish. This is a very simple option that your teen can help out with. Check out the full tutorial from Hayley Williams! 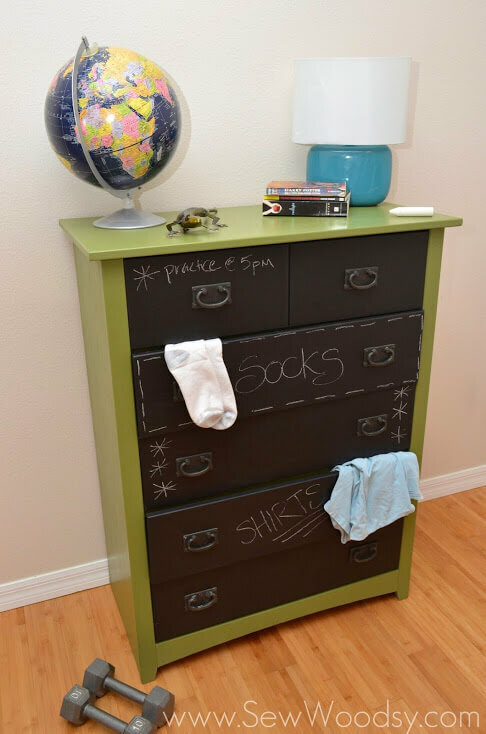 This clever dresser solution lets teens write notes on their dresser or label the drawers accordingly. 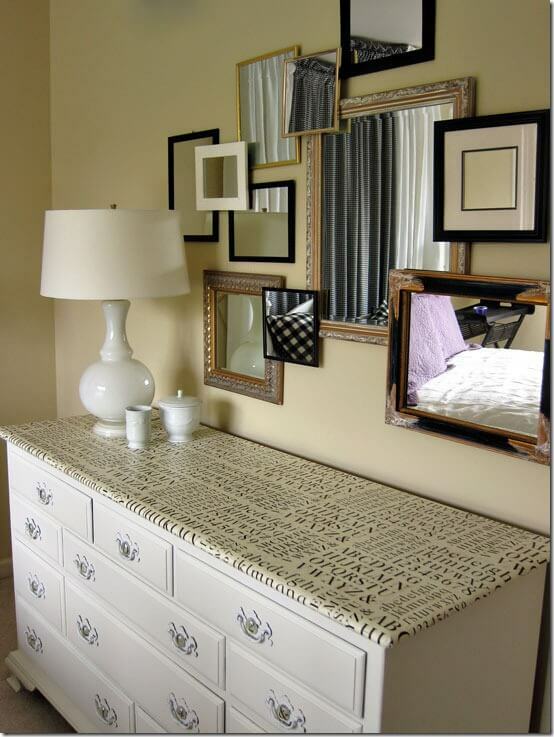 This is a really neat way to take an old dresser and transform it into a modern piece of furniture your teen will love. Check out the full tutorial from Sew Woodsy! 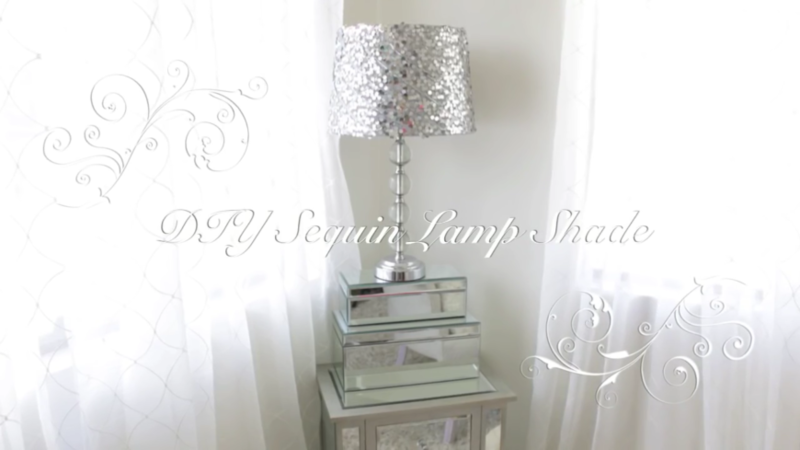 If the teenage girl in your life desires a little bit of glitz and glamour, this simple sequin lampshade may be just the ticket! 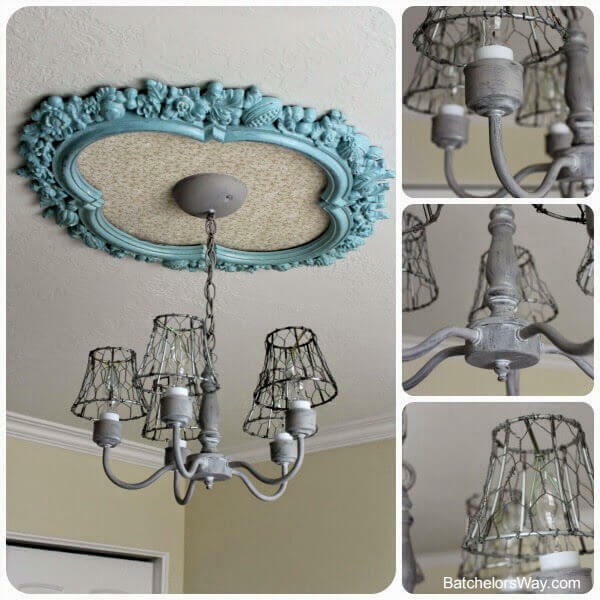 Transform any old lampshade into one that’s just her taste. Check out the full tutorial from Christine Kobzeff! 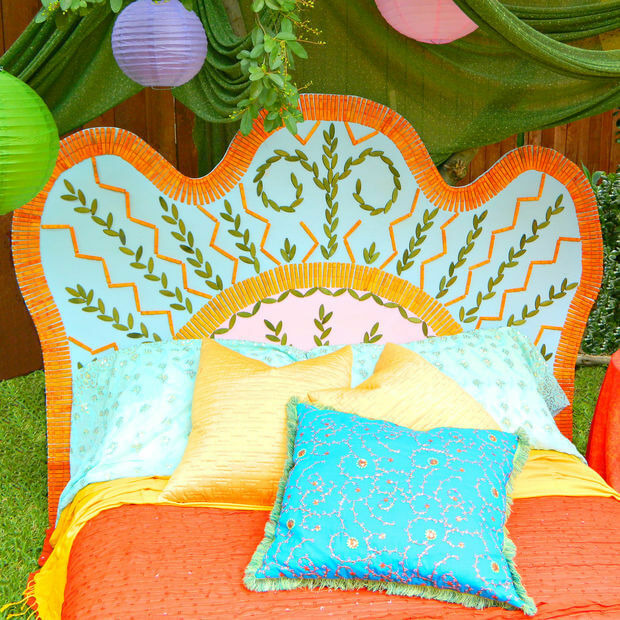 This brightly colored headboard is perfect for a Bohemian-chic bedroom of a teen girl! The finished product looks great, and you’ll be surprised at how simple this really is! 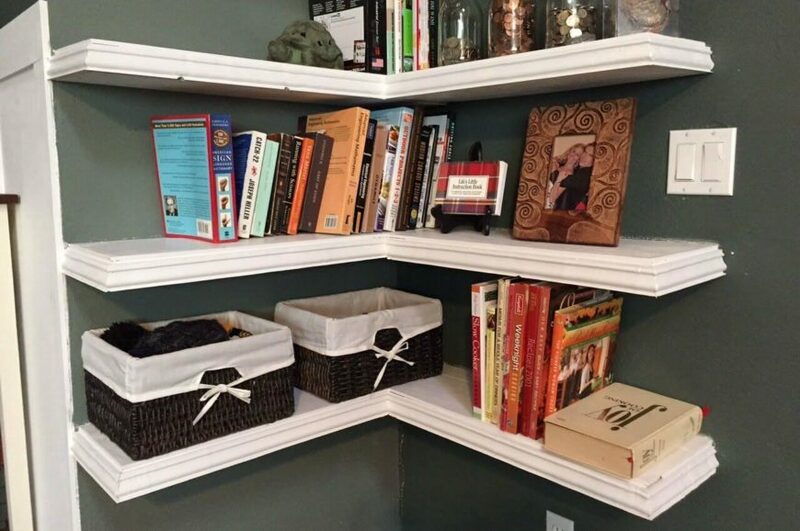 These simple shelves are easy to make and are perfect for storing your teen’s favorite knick-knacks, books, or anything else they need to find a place for! 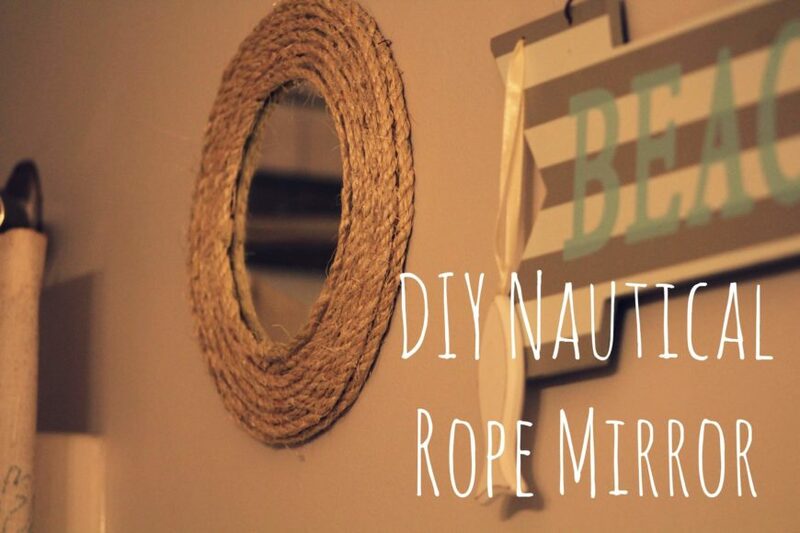 Check out the full tutorial from Dazzle DIY! 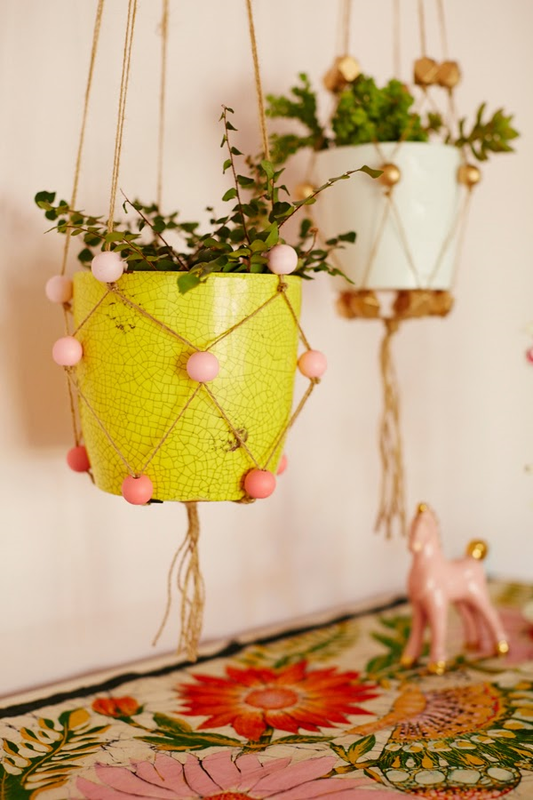 These adorable flower pots were once plain terra cotta, but have been transformed into glittery planters that any teenage girl would love to have in her bedroom. 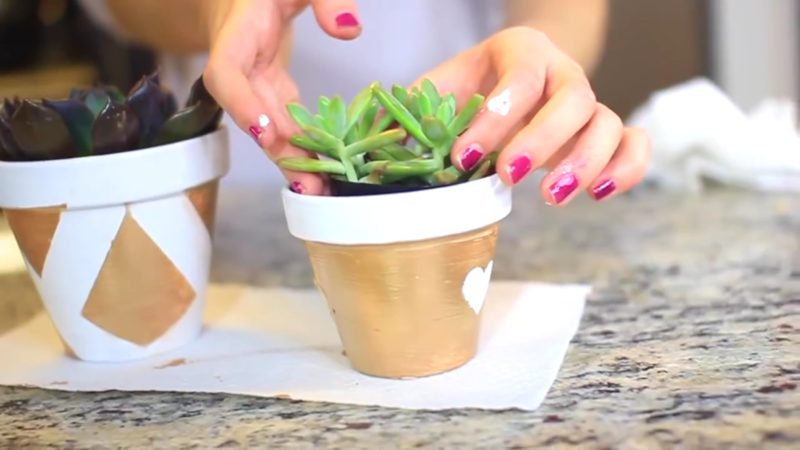 Planting easy-to-care-for succulents are the perfect way to add a little greenery to any space! Check out the full tutorial from Shelby Church! 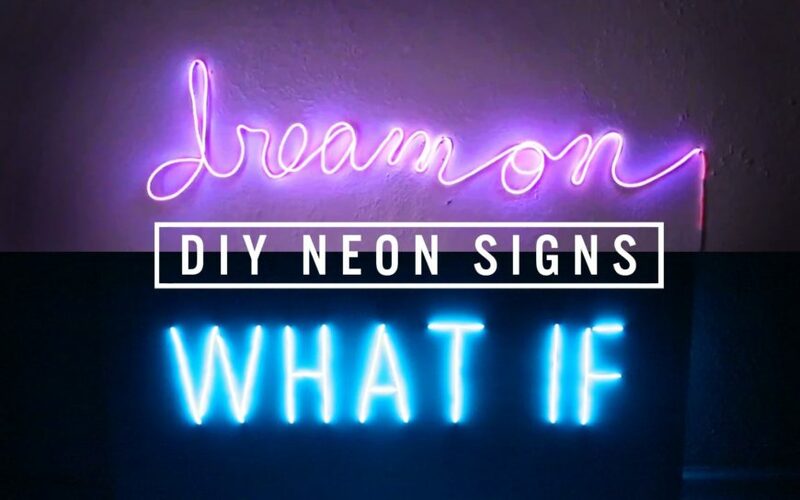 This may look flashy, but you don’t have to be an expert to make a great brightly colored sign for your teenager’s space. Pick a favorite saying, then get to work! Check out the full tutorial from The Sorry Girls! These adorable cardboard drawer dividers are the perfect way to keep baby’s clothes neatly separated. 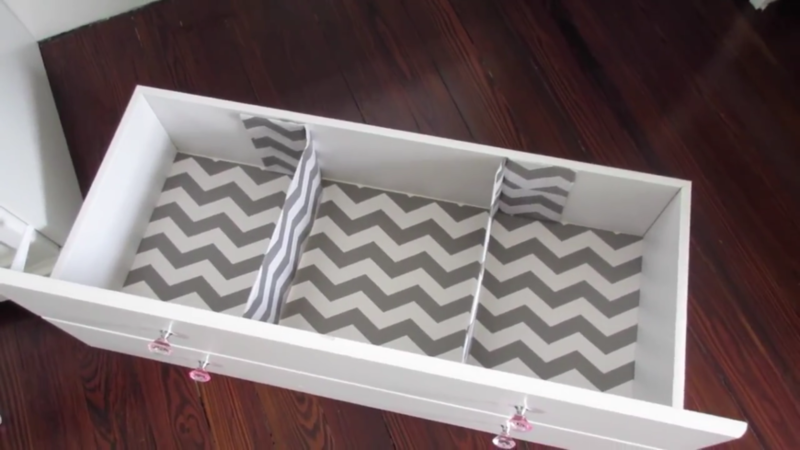 This is a super easy DIY that will spruce up any old dresser and make it perfect for baby’s room. Check out the full tutorial from Frugal, Fun, and Fabulous! There’s nothing like simple, bright wall art for a baby’s nursery. 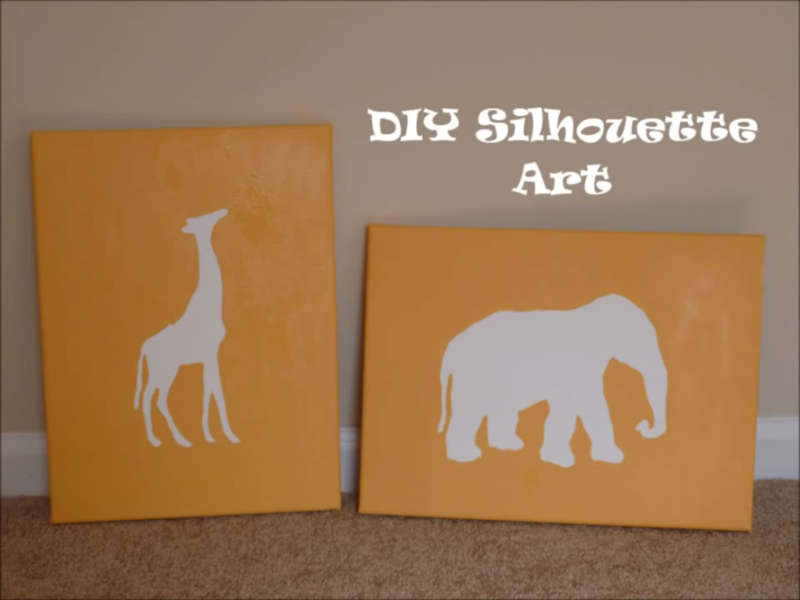 This simple tutorial will give you the tools you need to create adorable artwork for the nursery. The shown project features African animals, but can be adapted to fit any nursery décor. Check out the full tutorial from Do It On A Dime Family! 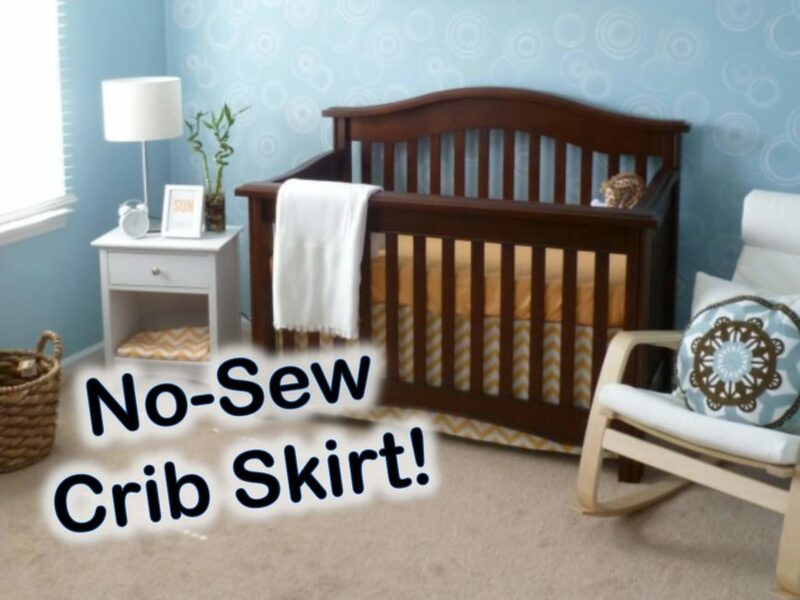 Crib skirts can be so expensive! This simple no-sew is the perfect way to get the perfect look for your nursery without shelling out a lot of cash. This is a great idea for inexperienced crafters! 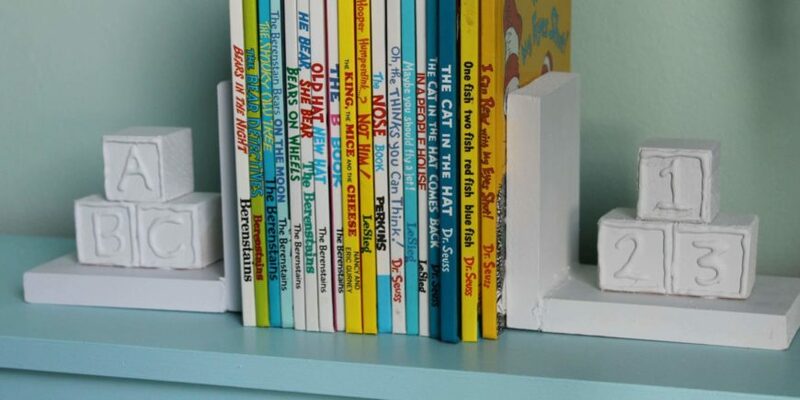 These adorable bookends are incredibly easy to make and so cute for a baby’s room! This is a very easy option that basically anyone can do with just a few spare hours and some simple, inexpensive materials. Check out the full tutorial from Jessica Joaquin! 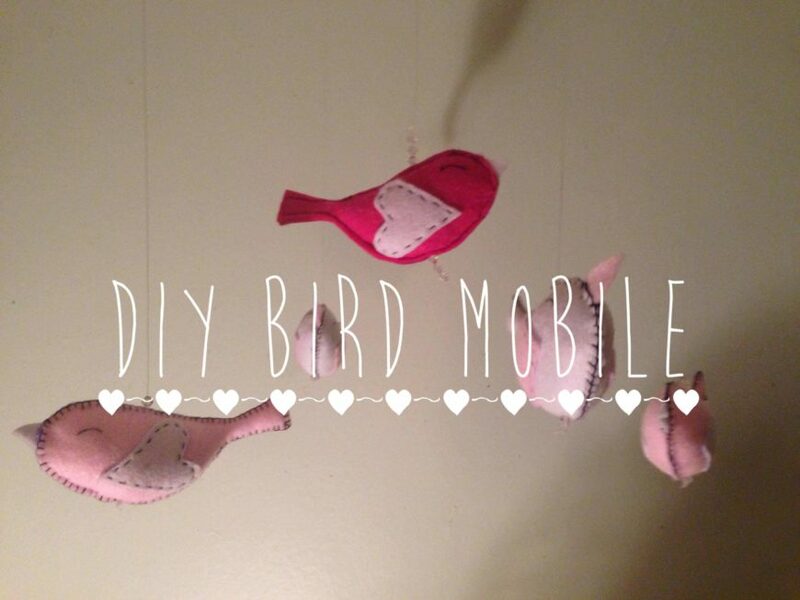 This adorable felt bird mobile is perfect for baby’s nursery! There are no hard pieces and the brightly colored felt birds are sure to enthrall your little one! Check out the full tutorial from Life As Loz! Looking to shout to the world that you love the beach! 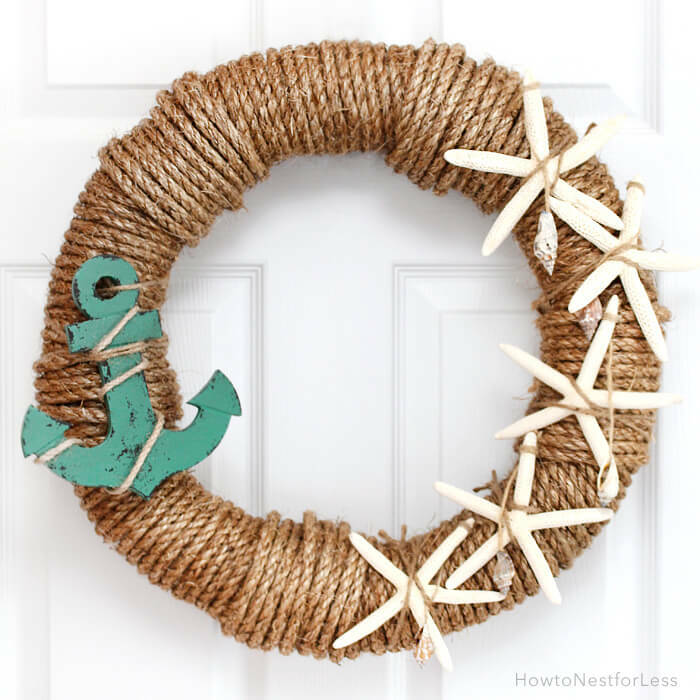 This adorable rope wreath is perfect for any beach house—or for any home you want to feel like a beach house! Check out the full tutorial from How To Nest For Less! 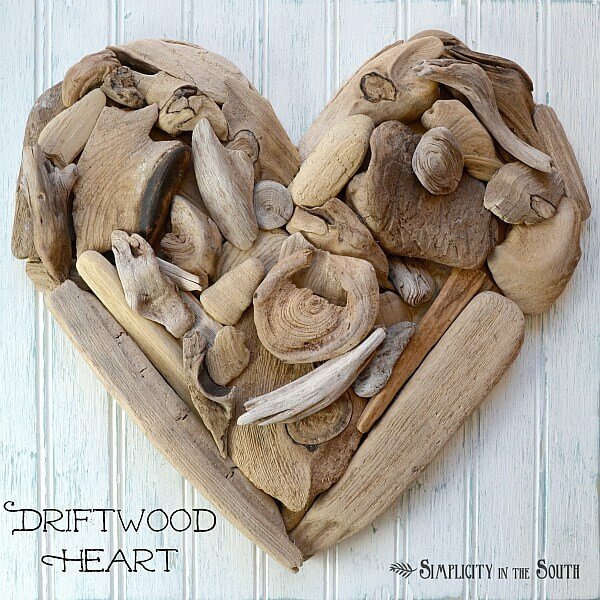 This simple heart wall decor can be created simply by collecting the odd bits of driftwood from some of your favorite beaches. 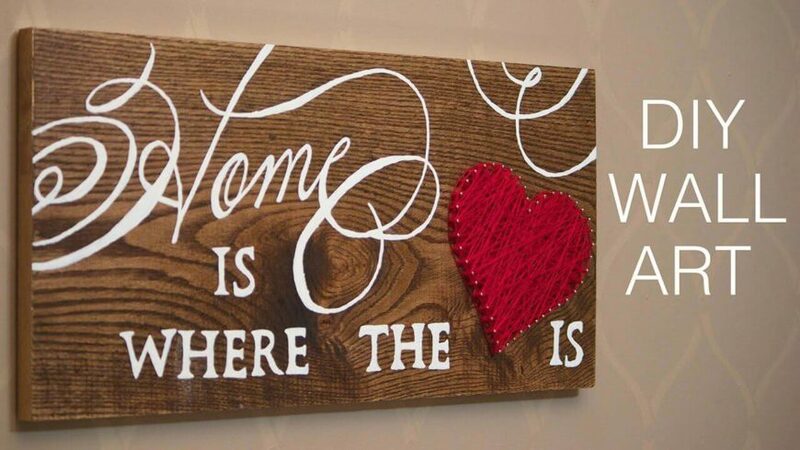 Create a piece of home that will hearken back to some of your favorite memories! Check out the full tutorial from Simplicity In The South! This is another simple concept that captures the essence of beach home. This is perfect for beginners and even kids! Check out the full tutorial from Dezine Fun! 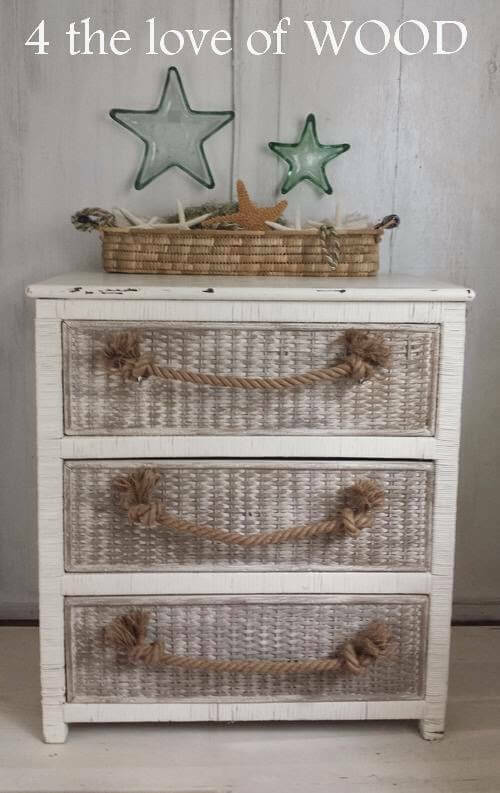 This adorable piece may be a dresser, but it would look fantastic in nearly any space, especially in the foyer to hold odds and ends. 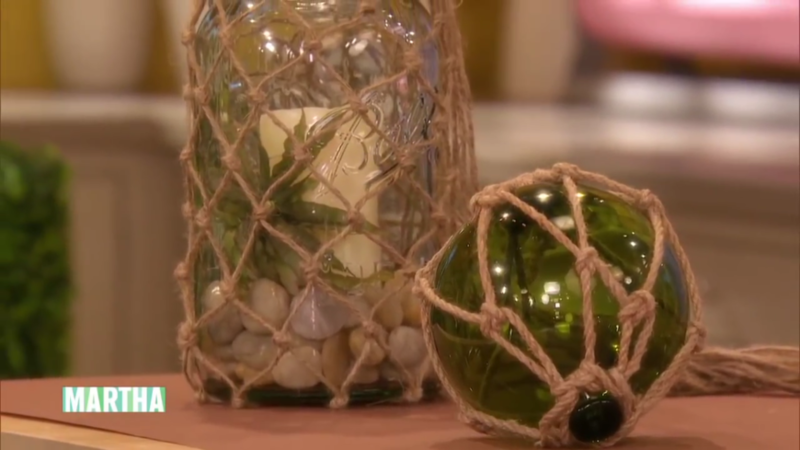 There’s nothing quite like beach glass and knotted lanterns to bring to mind the beach! 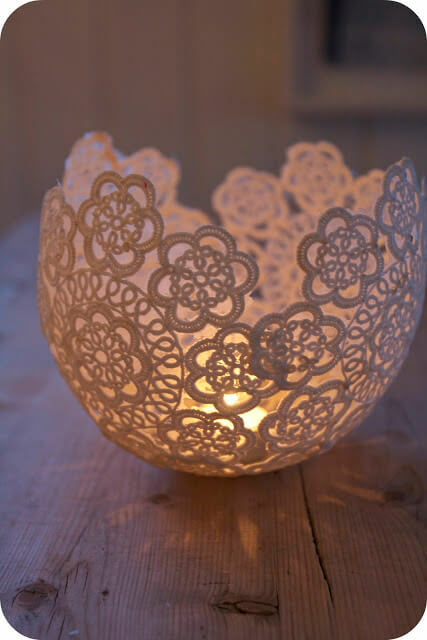 These are really simple to make and look great both indoors and outdoors! Check out the full tutorial from Martha Stewart! 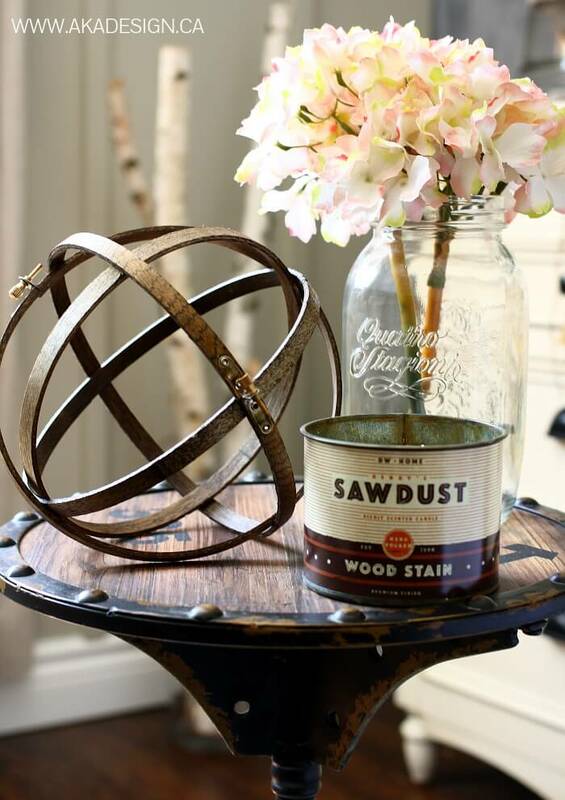 These adorable vases are made from painted vintage mason jars and a little sandpaper is used to create a neat worn effect. This is a super simple project that looks great with traditional farmhouse style homes, industrial, shabby chic, and many many more! Check out the full tutorial from Keep Calm and Blush On! 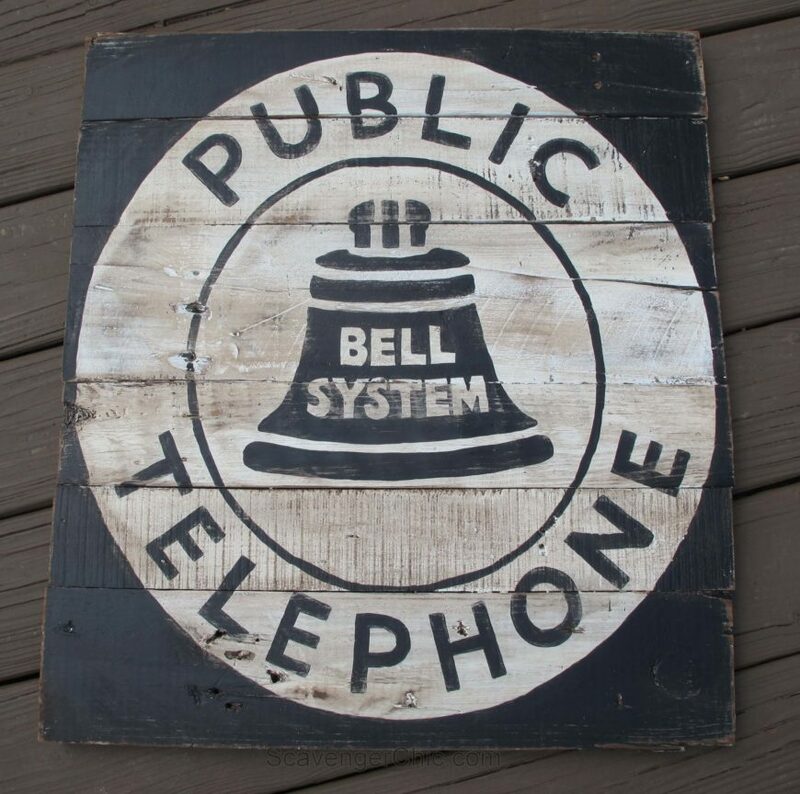 There’s nothing like a vintage sign to really invoke the feeling of times long past, but it can be hard to find authentic vintage signs that are in great shape and won’t break the bank. This simple approach will show you how to create your own fantastic designs! Check out the full tutorial from Scavenger Chic! A fireplace without a mantle seems so bare, but an ornate mantle might not fit your design scheme or be out of reach for your skills. 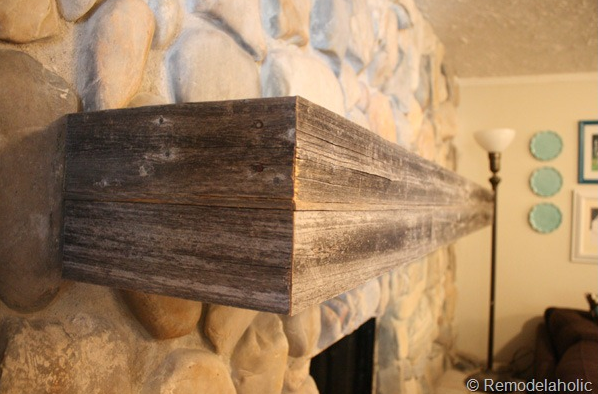 This rustic wooden mantle is the perfect solution for those who want a rustic fireplace mantle with little to no fuss! Check out the full tutorial from Remodel-aholic! Looking for a unique way to display family photos in a distinctly vintage way? 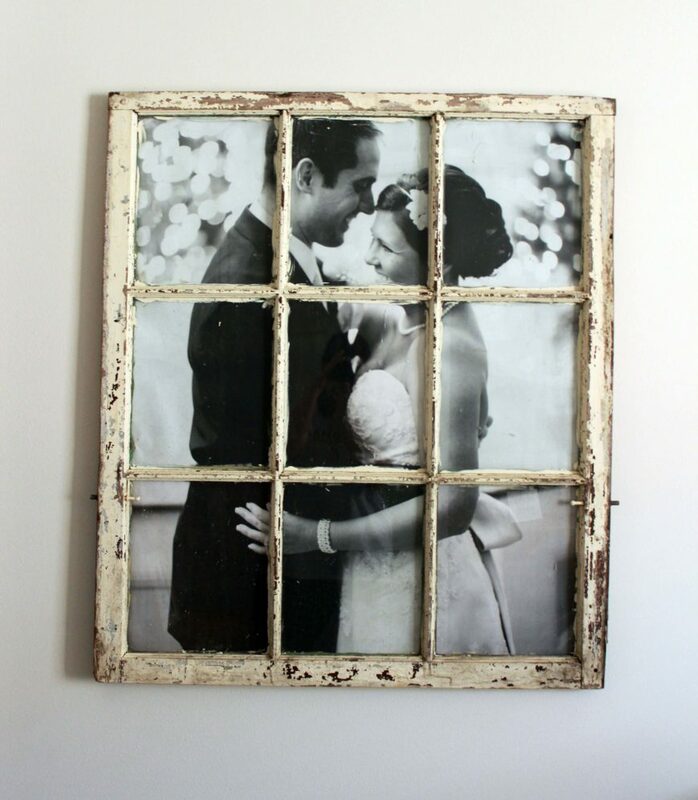 This simple idea will have you displaying your favorite photos in a vintage window. Display one picture in each section, or one large image. Check out the full tutorial from The Hamby Home! 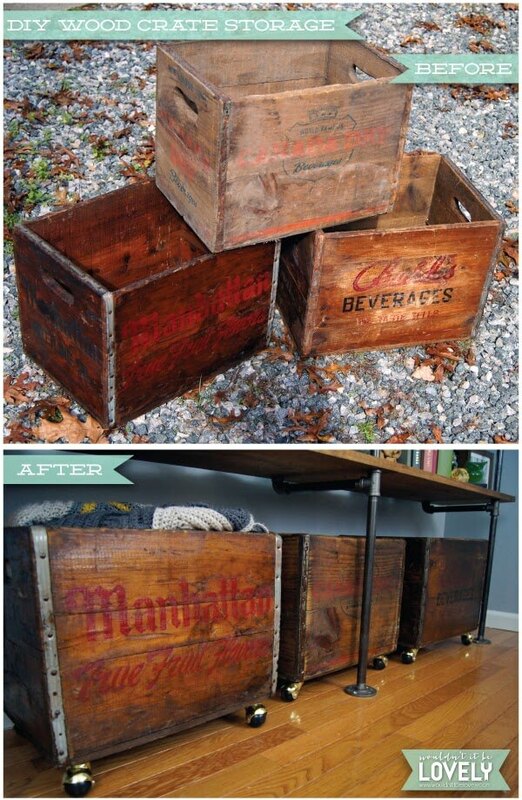 Transform vintage storage crates into convenient, clever storage options with this! Choose weathered old crates gathered at flea markets or antique stores with logos from local companies for a unique look! Check out the full tutorial from Wouldn’t It Be Lovely! 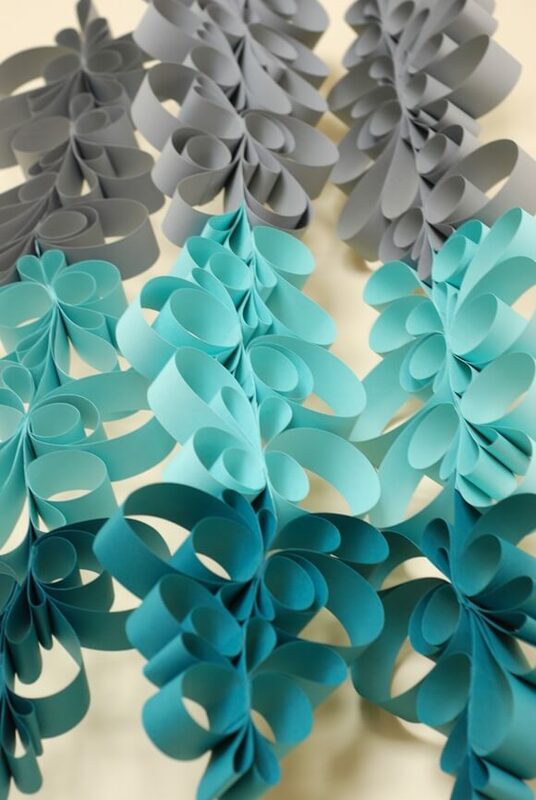 These origami butterflies are just gorgeous! 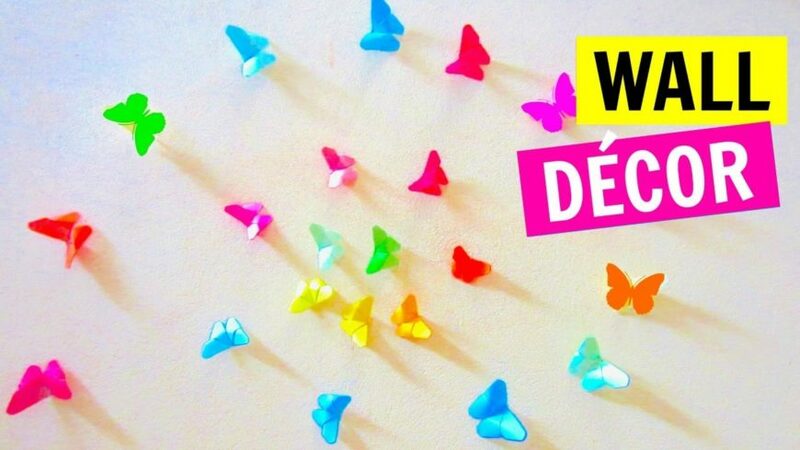 This is a great craft to make with older children or teenagers—they’ll love creating the butterflies out of colorful paper and using them to create patterns on the walls! Check out the full tutorial from Aira Tran! 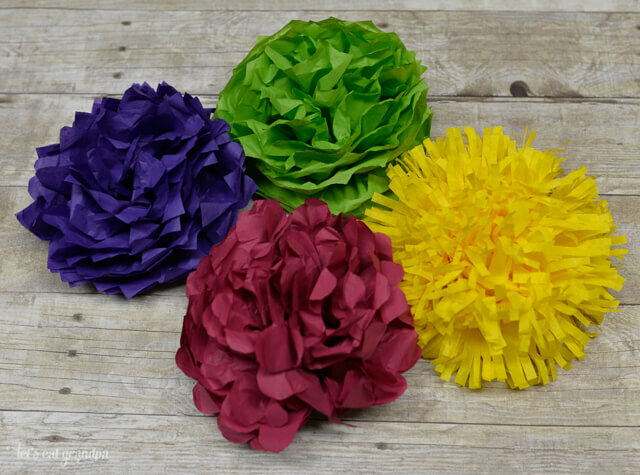 These colorful and fluffy paper pom-poms are made to resemble flowers including chrysanthemums, and look great hanging from the ceiling. Perfect for teen or dorm! Check out the full tutorial from Hey, Let’s Make Stuff! 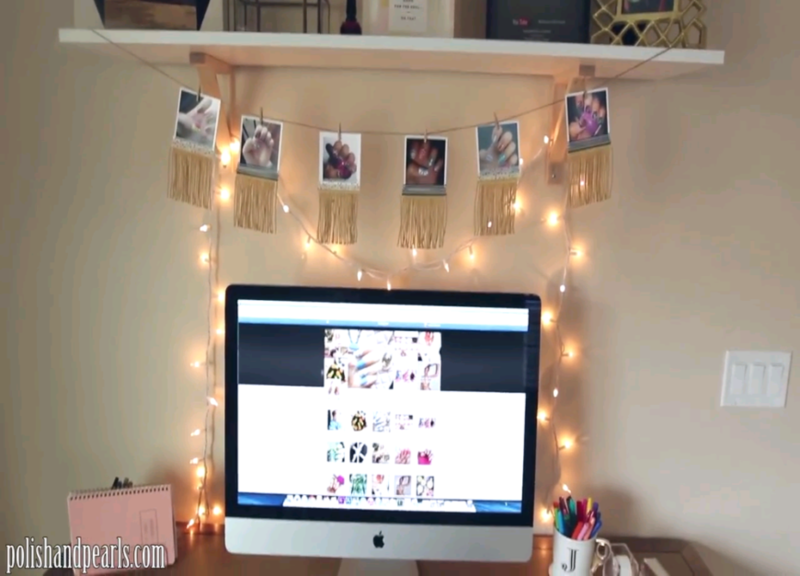 This super cute photo garland is simple to make and a great way to display polaroids in a bedroom or office. The fringe gives it a little extra style and oomph! Check out the full tutorial from Jenny Claire Fox! 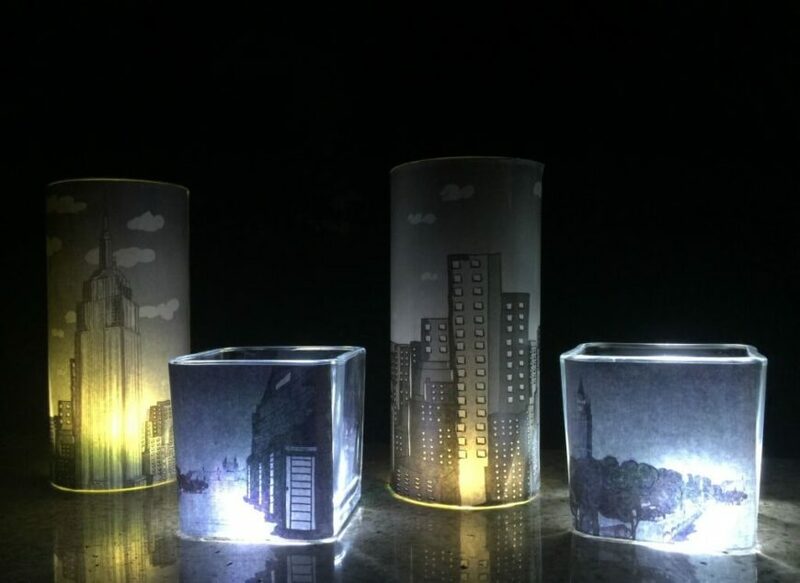 These lovely lights are simple to make and create an incredible soft luminary that’s perfect for a metropolitan night light or just for mood lighting. Check out the full tutorial from A Little Craft In Your Day! 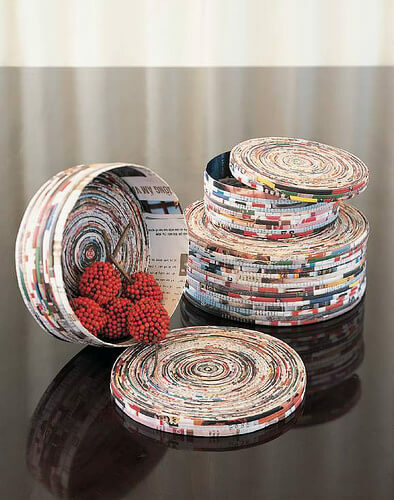 These super cute magazine boxes are an eclectic way to store odds and ends around the house, or you can leave the tops off to create adorable bowls and centerpieces. Check out the full tutorial from Abstract Octopus! 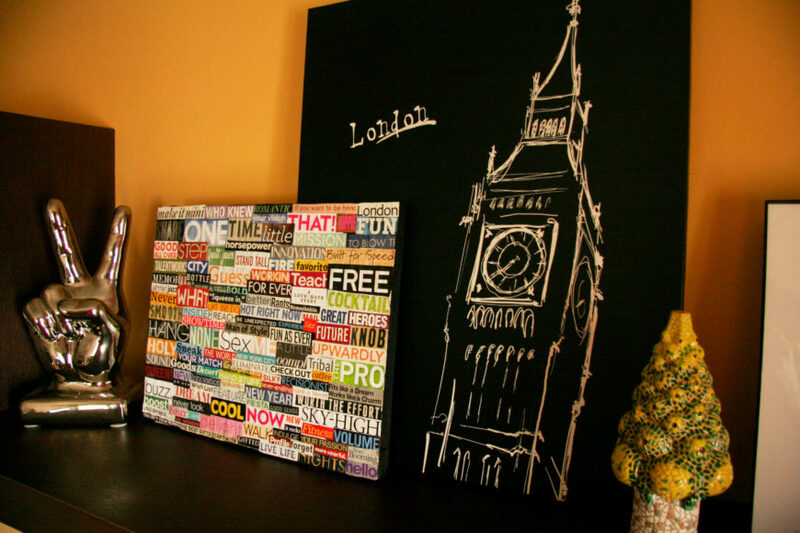 This adorable bit of wall art is created by picking out words and phrases out of magazines and attaching them to a canvas! 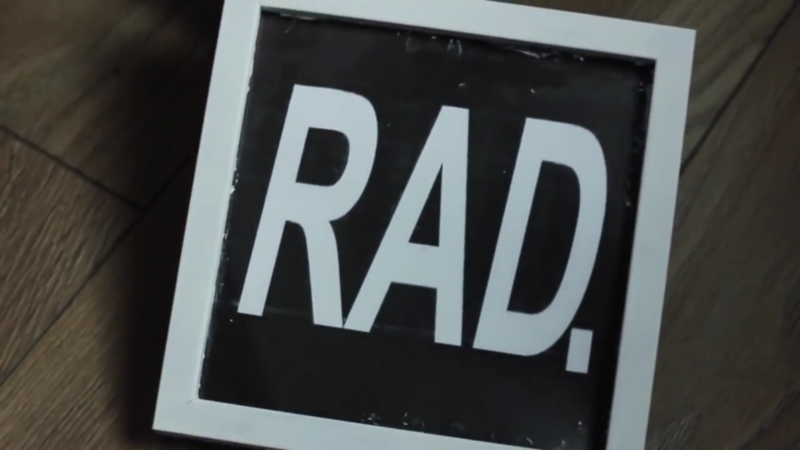 This is a super easy DIY that teens and older children will love to help out with. Check out the full tutorial from All Put Together! 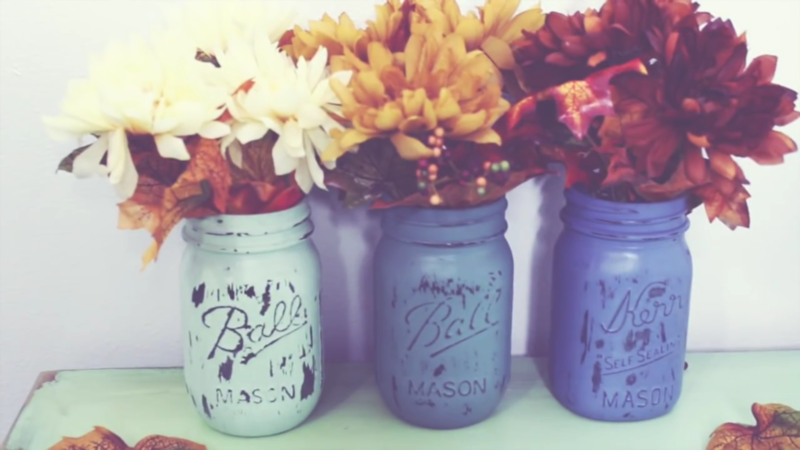 Using paint on a mason jar and filling it with flowers is a great way to make a statement, and a super easy project. 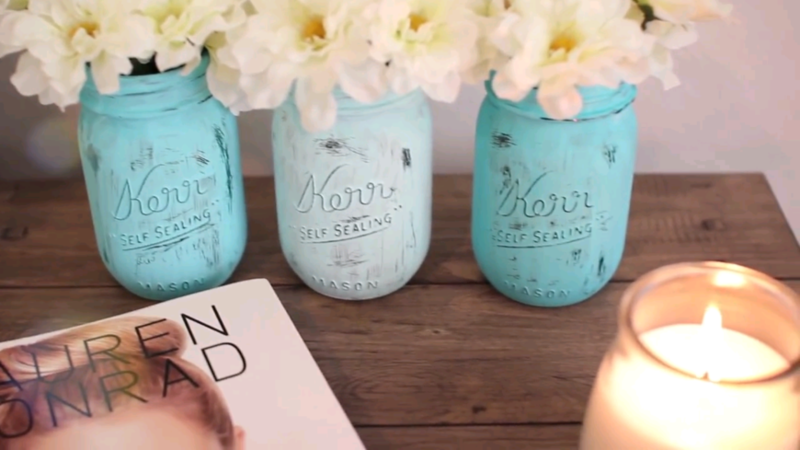 This tutorial video covers several ways to dress up those jars! Check out the full tutorial from LagunaBeachLove10! 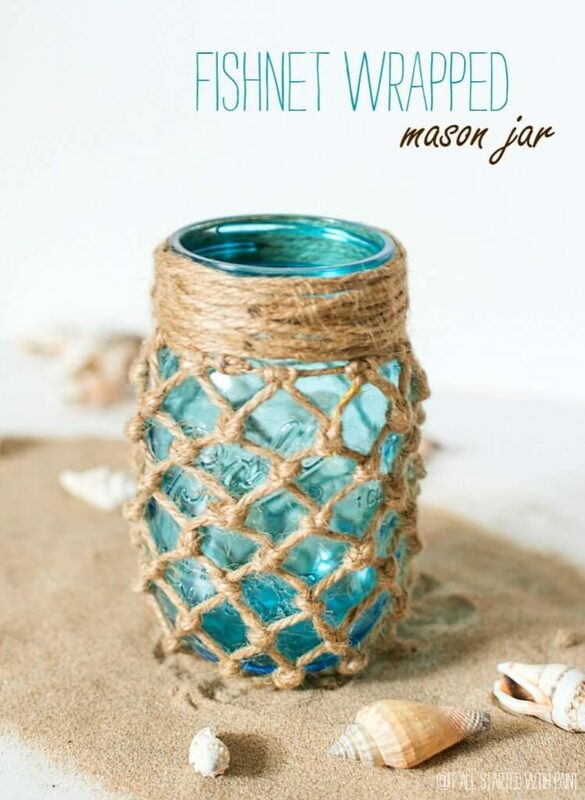 A bit of twine over a blue mason jar has a decidedly beachy feel and looks great as a luminary, a vase, or just by itself! Check out the full tutorial from It All Started With Paint! Washi tape is a great way to make small improvements to a room without a lot of mess or fuss, and it’s perfect for dorm rooms as well! 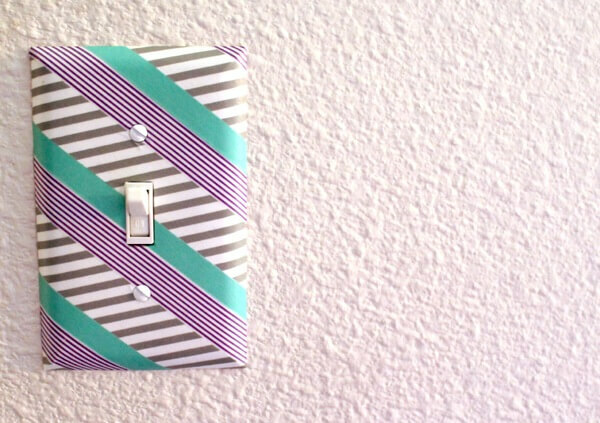 Dress up your plain white switch plates with a bit of tape for color and style. 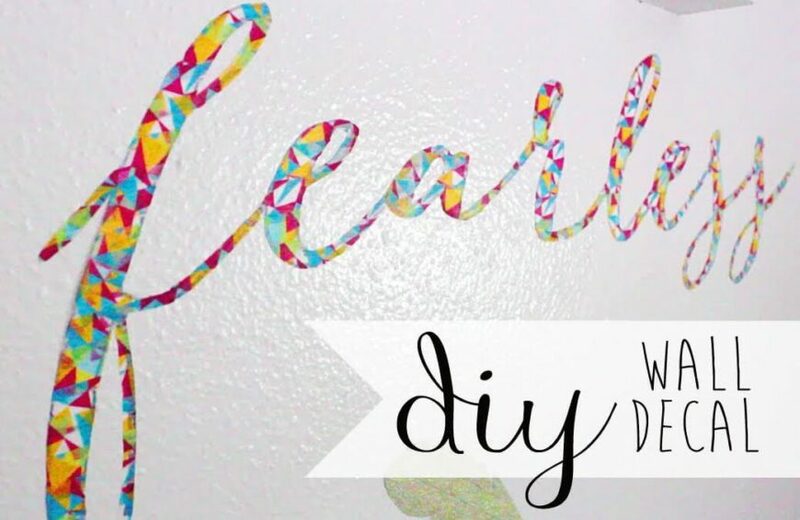 Check out the full tutorial from Washi Tape Crafts! This adorable decal looks like it was difficult to make, but it’s a very simple DIY that only requires patience and a little care to do right. These decals are easy to remove and won’t damage walls, making them great for dorm rooms! Check out the full tutorial from Xao Vang! 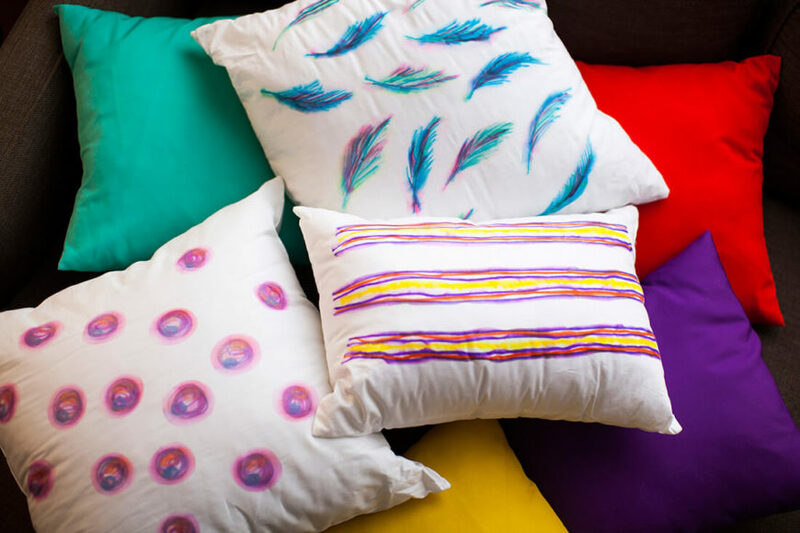 These adorable throw pillows are colorful and look great in any space, but particularly in a teenage girl’s bedroom. No one would ever guess that you made them with sharpies! Check out the full tutorial from Brit + Co! 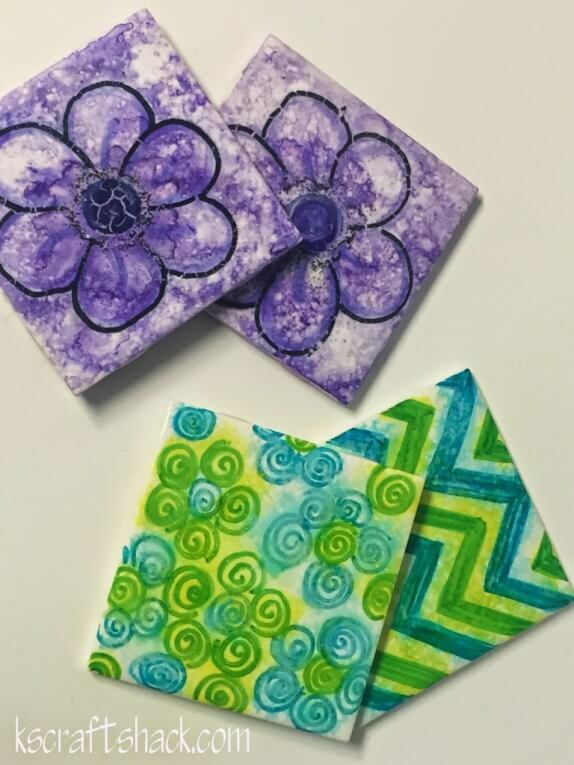 You won’t believe how easy it is to make coasters with the perfect design! This project is something you can do on a rainy afternoon. Check out the full tutorial from K’s Craft Shack! 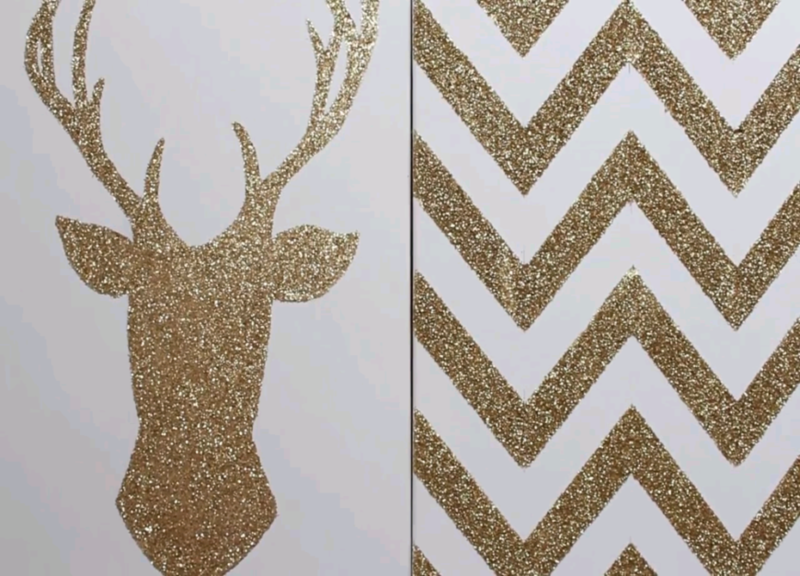 If a bit of sparkle is what you desire, these awesome glittery canvas prints are the perfect thing for your room or dorm; and they’re a super easy DIY! Check out the full tutorial from LaurDIY! 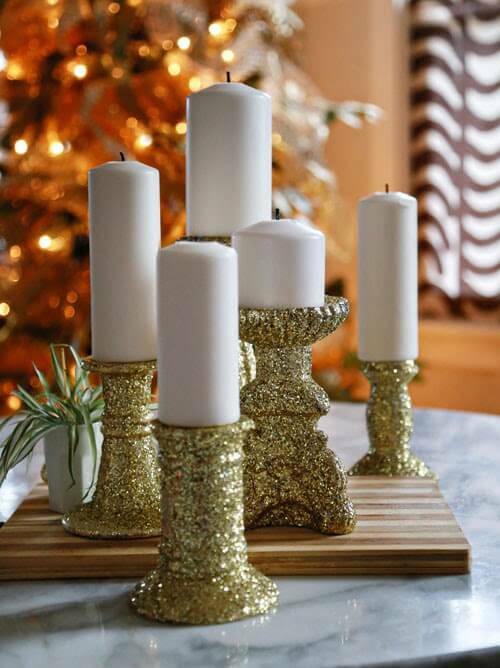 Dress up some old candlesticks with glitter! This tutorial will show you how to tackle glitter and make projects that won’t flake away. Keep the glitter on your projects—not on your carpet! Check out the full tutorial from I Love To Create! It can be hard to find a place to make use of old scraps of wrapping paper. 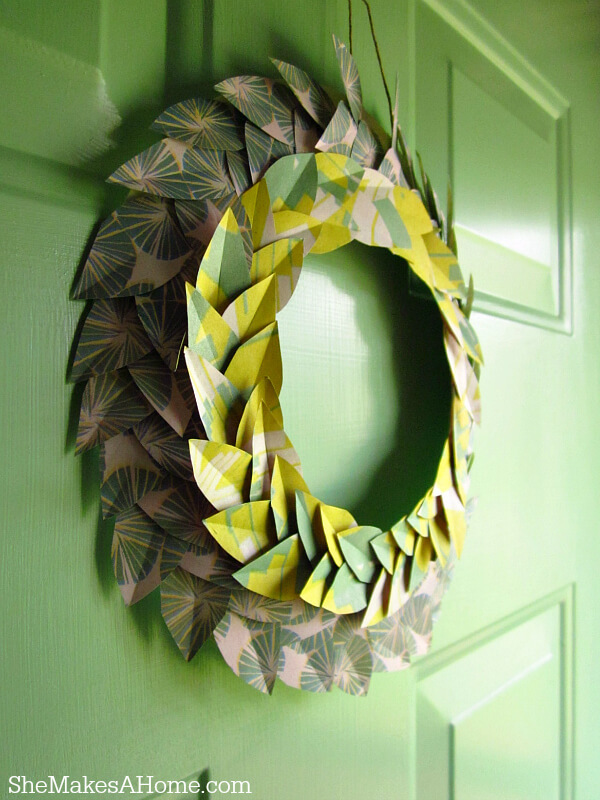 This project will have you using up your old scraps, ending up with an adorable new wreath that you’ll love to display. Check out the full tutorial from She Makes A Home! This awesome and unique dresser update will show you how to utilize some old wrapping paper to create a unique piece of furniture that everyone will love. See more dresser projects here. Check out the full tutorial from In My Own Style! This is a fun concept that takes advantage of a material you may have an abundance of around the house: popsicle sticks! Check out the full tutorial from Make & Do Crew! Embroidery hoops aren’t something everyone uses now, so they’re perfect items to recycle into unique home décor accents! Check out the full tutorial from AKA Design! 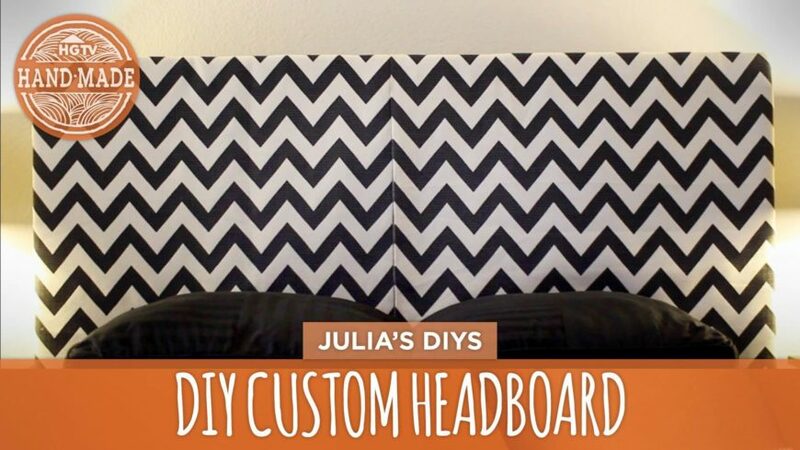 Who knew you could use cardboard to make a soft, cushy headboard? 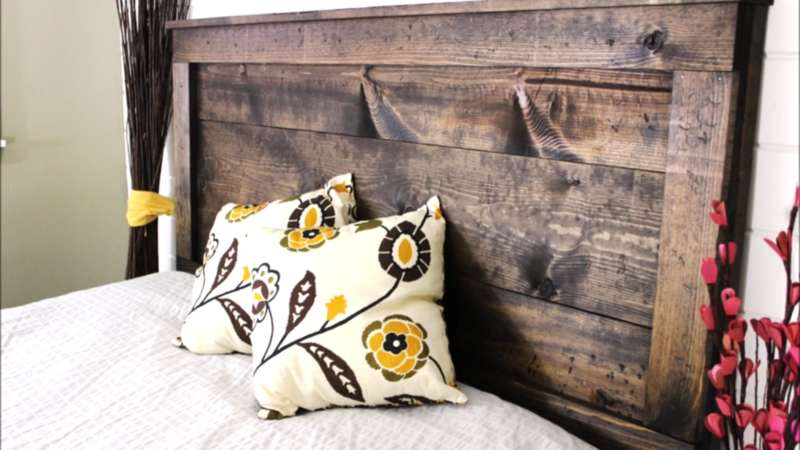 This project is great for sprucing up an older headboard, or for mounting to the wall directly. 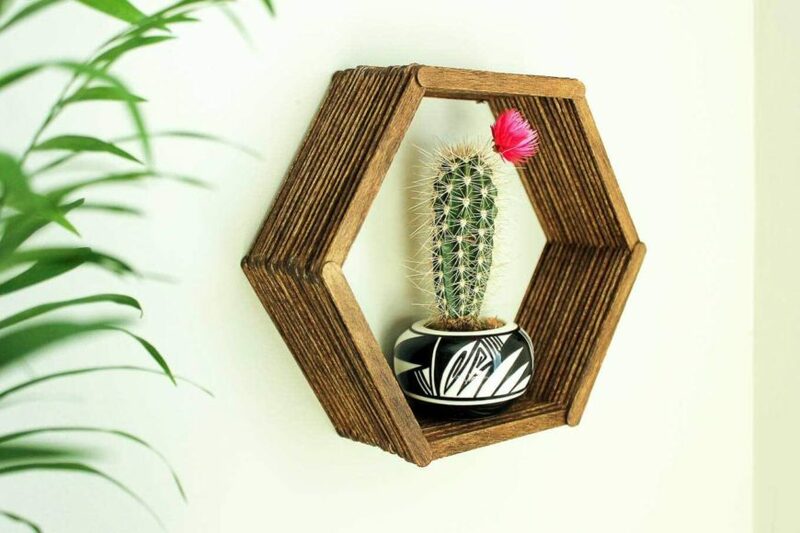 Check out the full tutorial from HGTV Handmade! 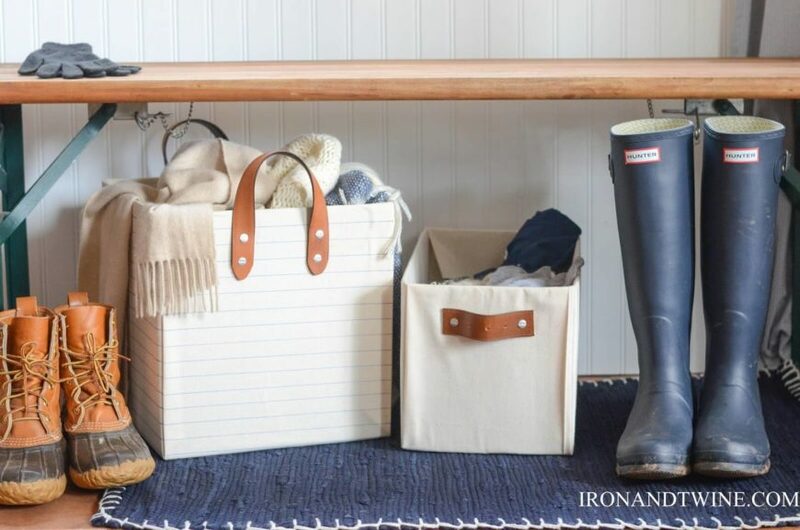 These adorable storage bins will go perfectly in a mudroom, foyer, or in a bedroom, and there’s no way you can tell that they’re made from cardboard! Check out the full tutorial from Iron & Twine! 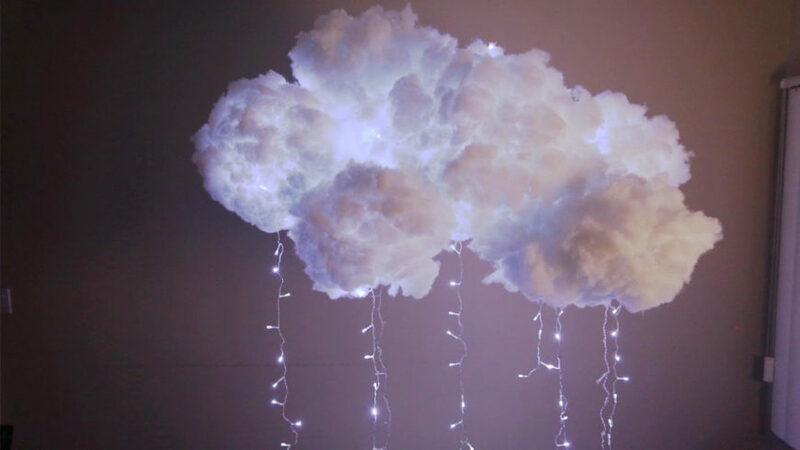 This incredible light fixture looks just like a cloud and utilizes blinking lights to resemble lighting inside the cloud! Check out the full tutorial from TiffyQuake! 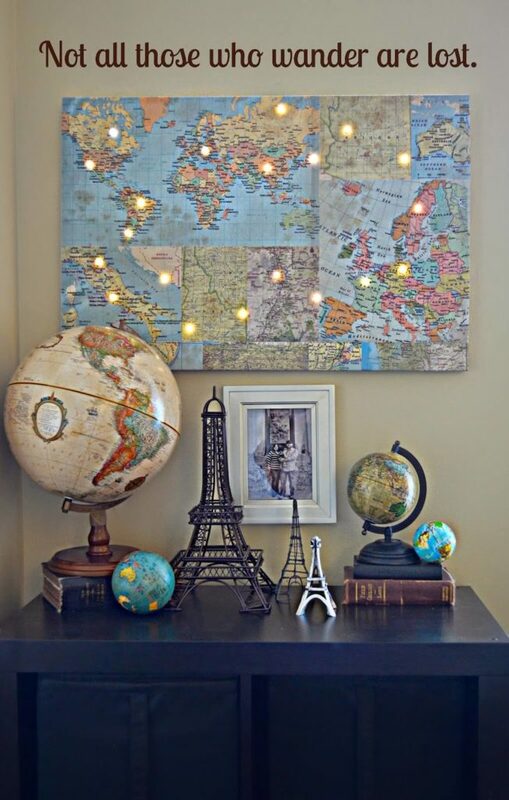 This awesome idea lets you pick your favorite spots around the world and light them up with string lights! This is an incredible piece of artwork that anyone will love. Check out the full tutorial from Hazel & Ruby! 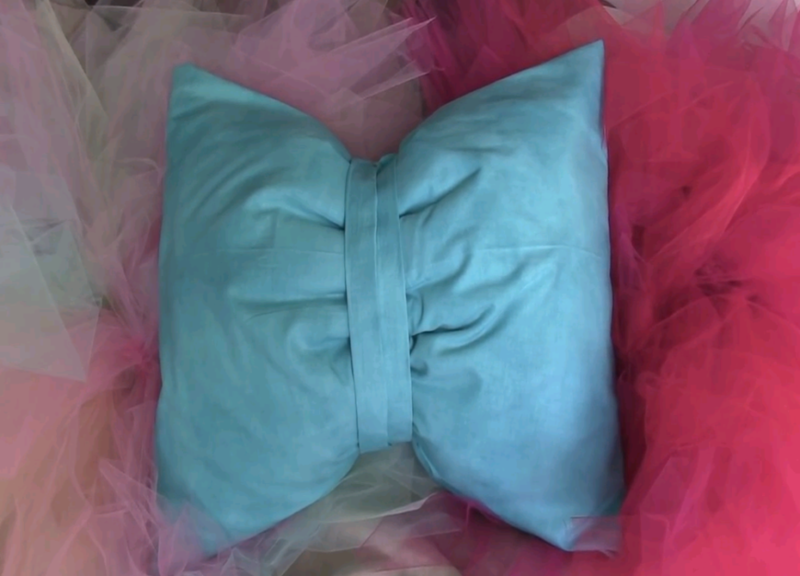 This is a neat idea that would look great in any teenage girl’s bedroom or in a dorm! This is an easy craft that you can do with the family. Check out the full tutorial from Bird’s Party! 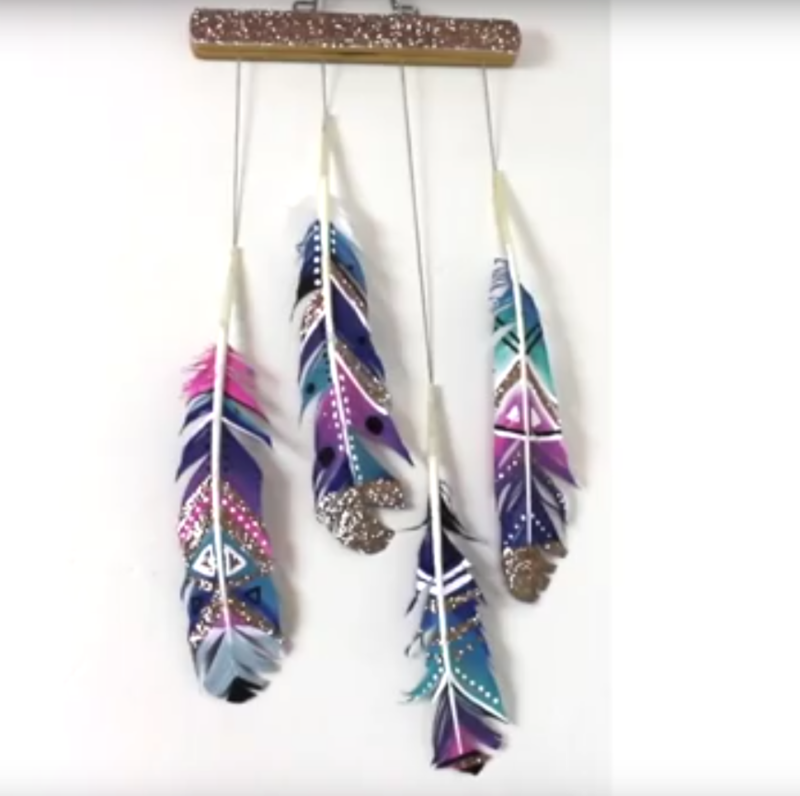 This perfectly colorful paper mobile is a great way to add color to a dorm or a teenager’s bedroom without a whole lot of mess. Check out the full tutorial from Awesomeness TV! Reupholstering an old chair is a lot of work, so why not take an easier option and utilize fabric paint to makeover that old chair! Fabric paint works well for upholstery that is in good shape. Check out the full tutorial from Chalkworthy! 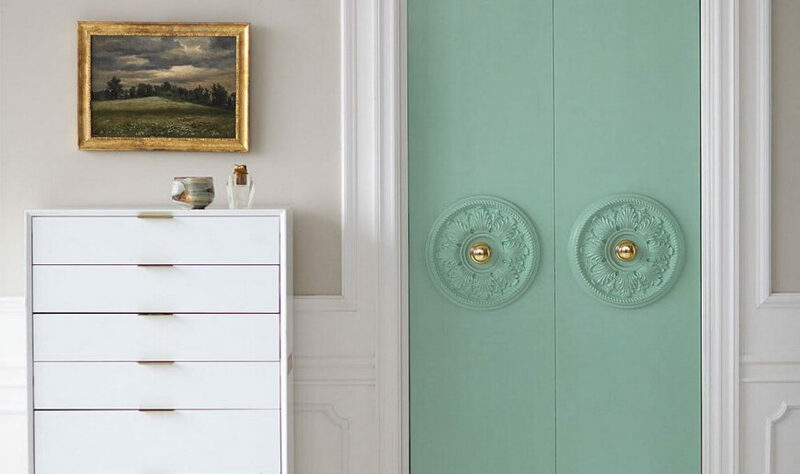 Dressing up those builder’s-grade closet doors is as simple as adding plaster medallions and a fresh coat of paint! Check out the full tutorial from One Kings Lane! 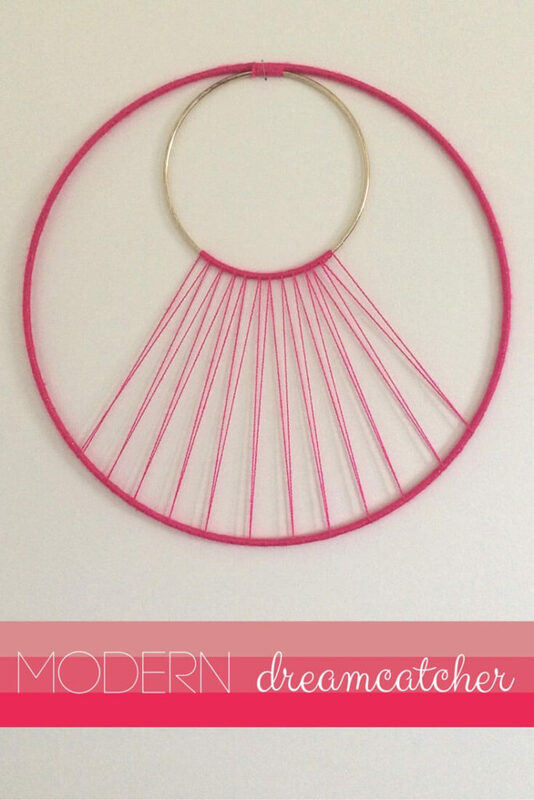 This modern art take on traditional dreamcatchers is a beautiful addition to any contemporary space. Check out the full tutorial from Being Spiffy! 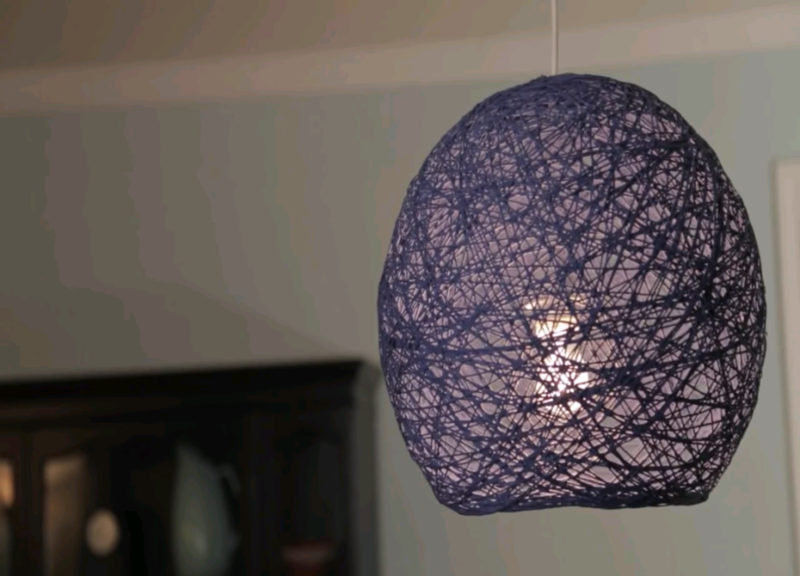 This creative take on yarn looks beautiful whether you use it as a lamp shade or as a hanging globe. Try all kinds of different colors to find the perfect look to add to your space! Check out the full tutorial from MADE Everyday! This beautiful craft will have your curtain tiebacks looking spiffy! 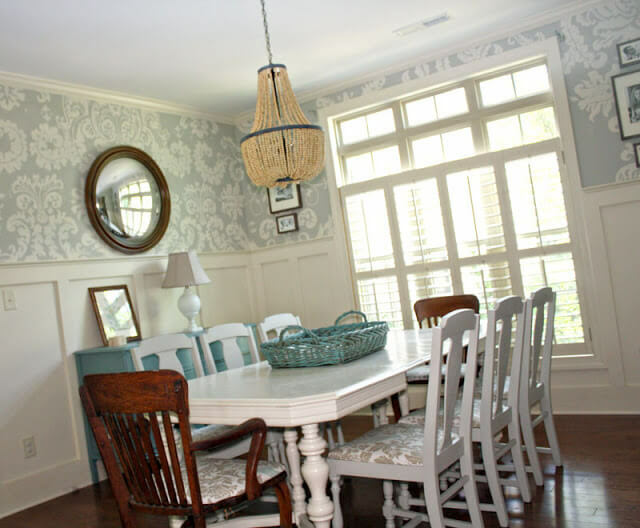 The project utilizes popular fabrics like burlap and lace to create a finished product that will fit any farmhouse or shabby chic style home. 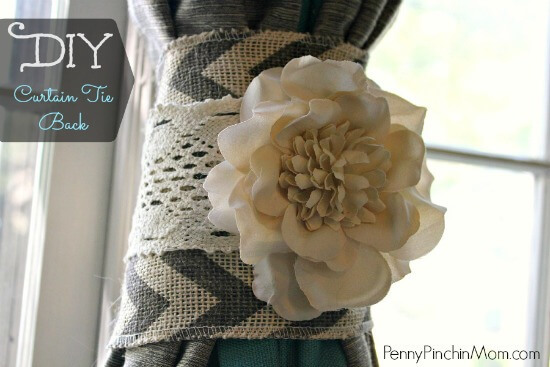 Check out the full tutorial from Penny Pinchin’ Mom! 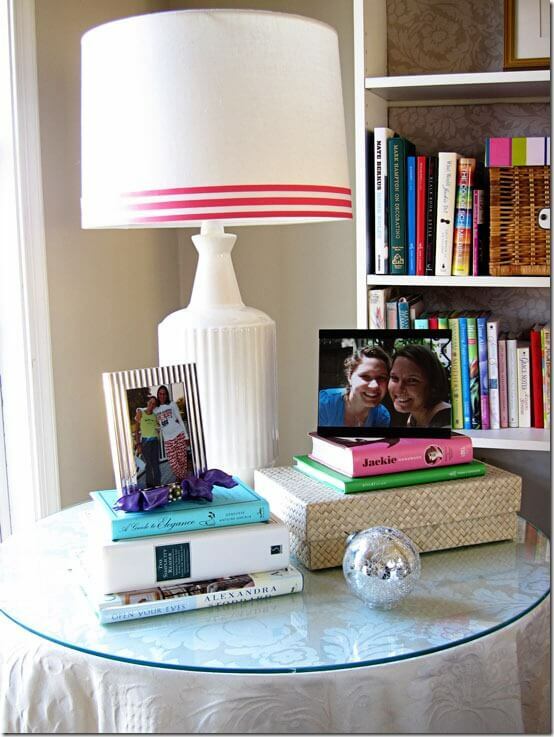 This is a super simple craft that will bring a little color and springtime to an old, plain lampshade! Phone charging cords can get messy and clutter up an otherwise clean and tidy space. 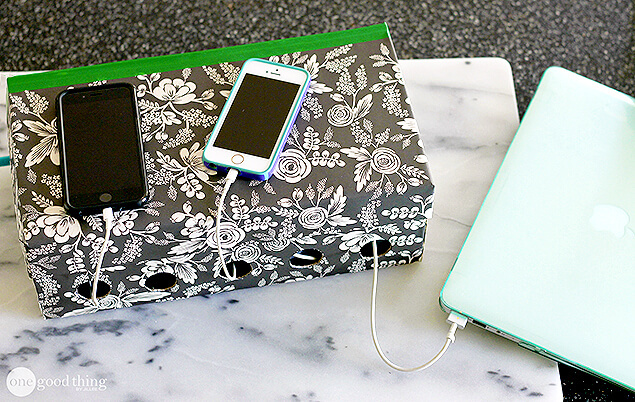 This DIY will have your cords wrangled and safely hidden out of sight! No more tangled cords! Check out the full tutorial from One Good Thing By Jillee! 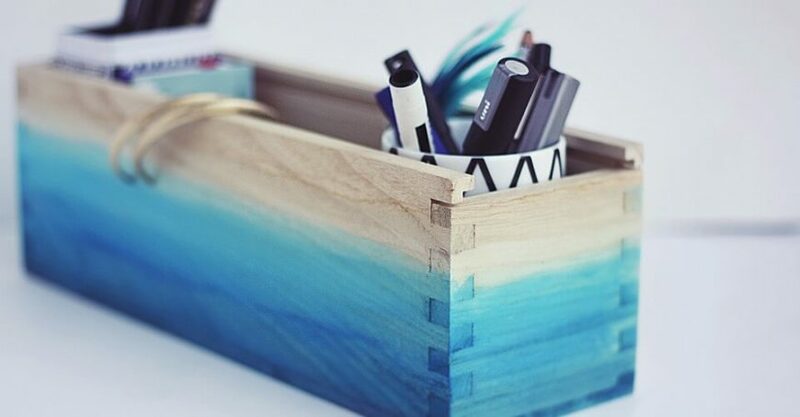 This simple wooden box is dressed up using a simple blue ombre paint job that is inspired by watercolor paintings. It’s the perfect spot to store pretty much anything! Check out the full tutorial from One O! This incredible chandelier was made with wooden beads and is a gorgeous addition to any dining room or foyer. This is a more challenging DIY for experienced DIYers! Check out the full tutorial from Gus and Lula! 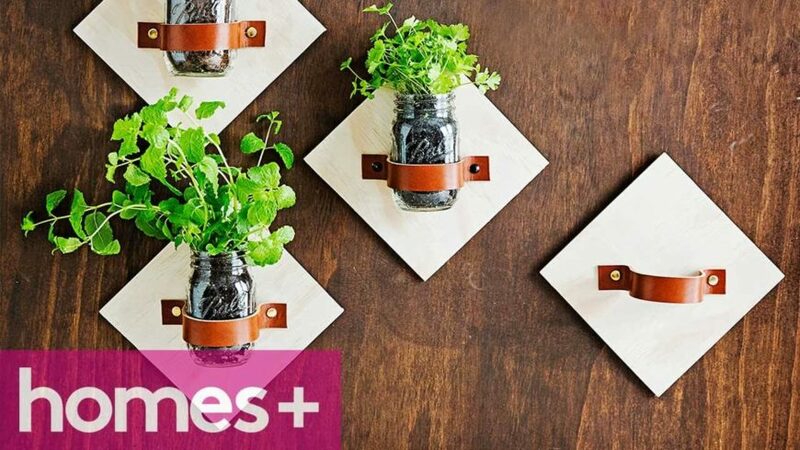 These adorable planters have a mid-century modern vibe to them that is just irresistible! Choose matte or metallic beads to slightly change the look! Check out the full tutorial from Honest to Nod! Have some extra balloons hanging around after a birthday party? 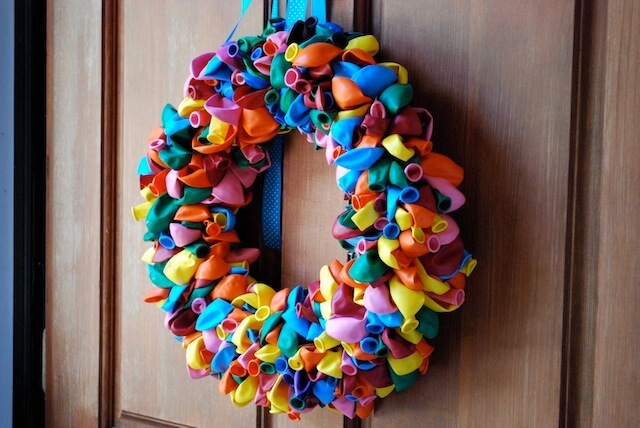 You can use those as the basis of this colorful and festive wreath for your front door! Check out the full tutorial from Abstract Grace! This adorable and elegant candleholder is the perfect addition to a dining table. We suggest using flameless luminaries to reduce any accidental fire risks! Check out the full tutorial from The Excited Bride! 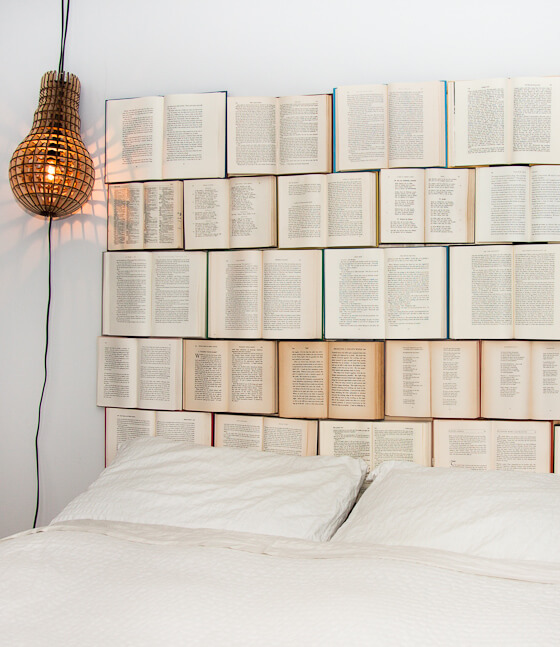 Utilize some old books to create this headboard masterpiece! Perfect for any book lover! Check out the full tutorial from Design Every Day! 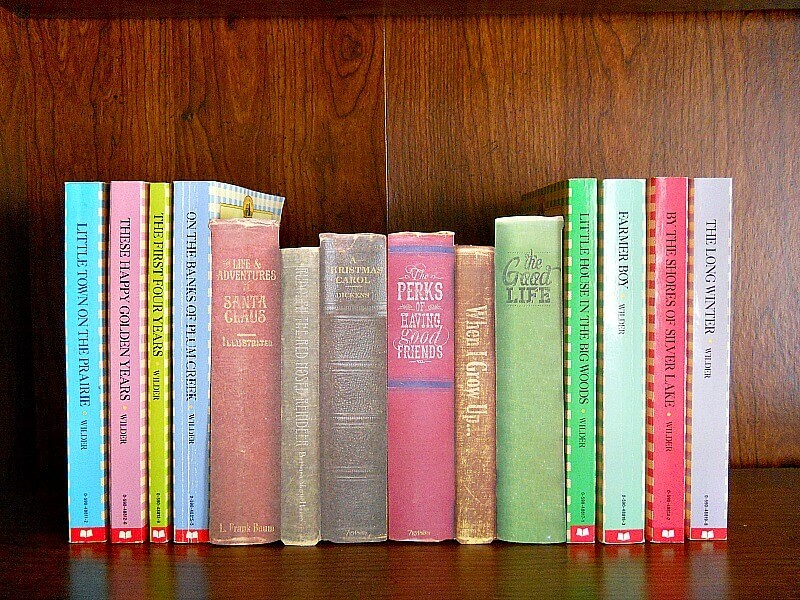 This uses old hardcover books to create a hidden storage compartment on your bookshelves! Check out the full tutorial from Blitsy! 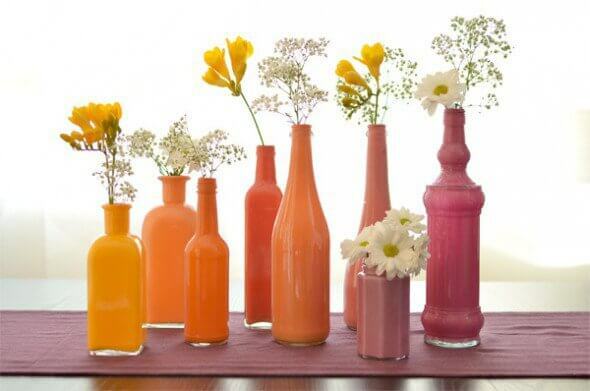 This is a classic project that transforms old glass bottles into colorful vases! Check out the full tutorial from Rustic Wedding Chic! Wine bottle chandeliers are incredibly popular for industrial and even farmhouse style homes, but a custom made one can get very pricey. Experienced DIYers can take on this project to create their very own customized wine bottle chandelier! 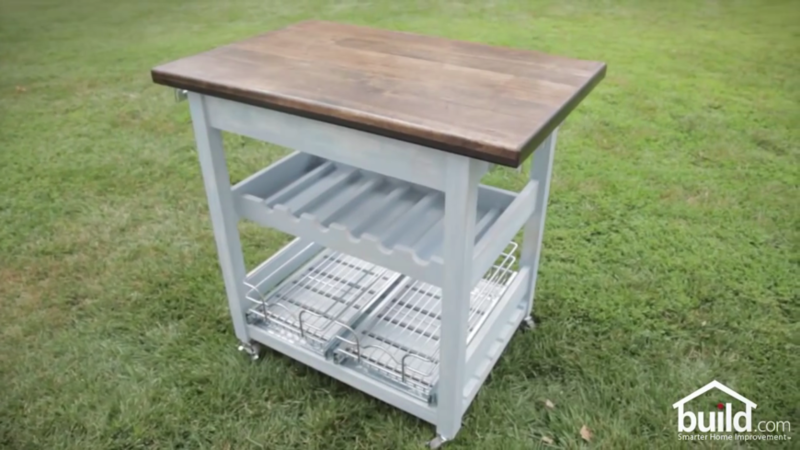 Check out the full tutorial from DIY Network! 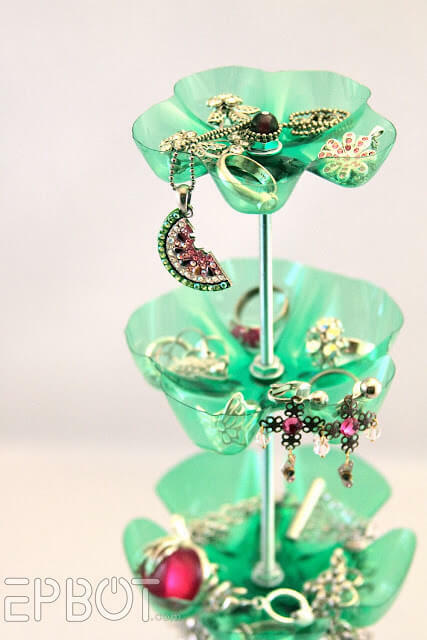 This clever recycled jewelry stand is made from large liter water bottles. For color, you can choose a different kind of bottle, like a Mountain Dew bottle. Check out the full tutorial from Epbot! 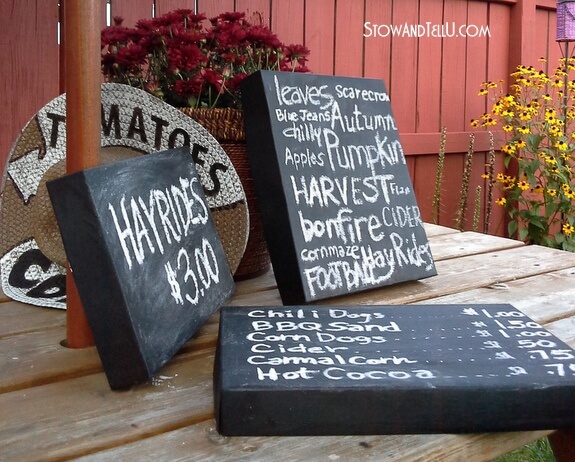 Shoebox lids become adorable chalkboard signs for the home! Check out the full tutorial from Stow And Tell U! 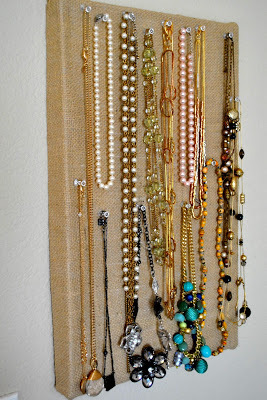 This clever DIY transforms an old shoebox into a jewelry board for hanging your favorite necklaces! Check out the full tutorial at Home Awaits! We’ve all seen those lovely canvases with melted crayons cascading down like rain on a silhouetted couple. 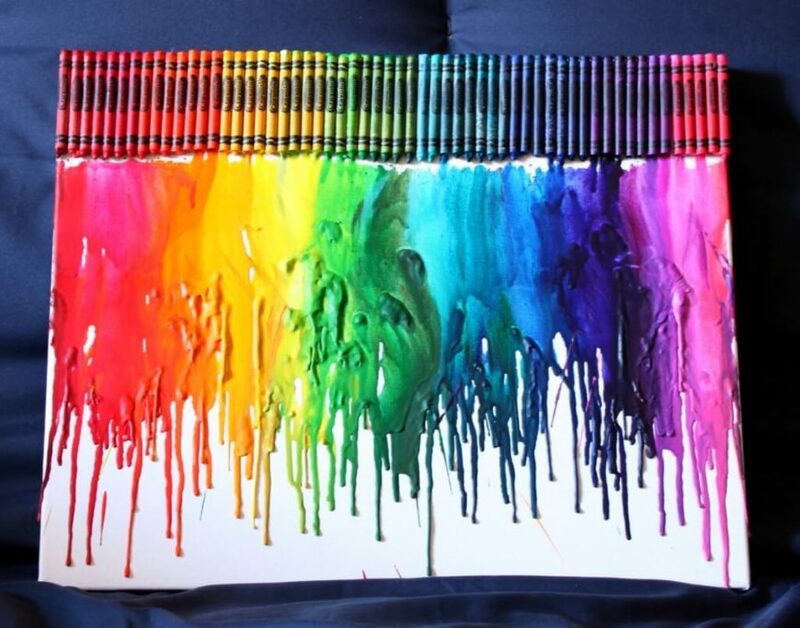 Now you can learn how to make your very own melted crayon art! Check out the full tutorial from 52 Kitchen Adventures! 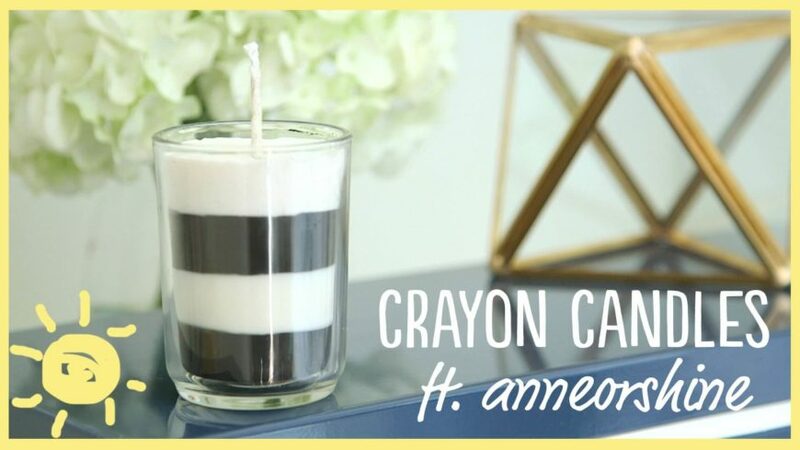 This is a super easy tutorial that will have you making your very own candles using your favorite scents! No more expensive candles. Check out the full tutorial from WhatsUpMoms! You’d never believe that this adorable utensil can was made from a recycled tin can! This is an easy DIY that will dress up your kitchen! Check out the full tutorial from Elsie Marley! 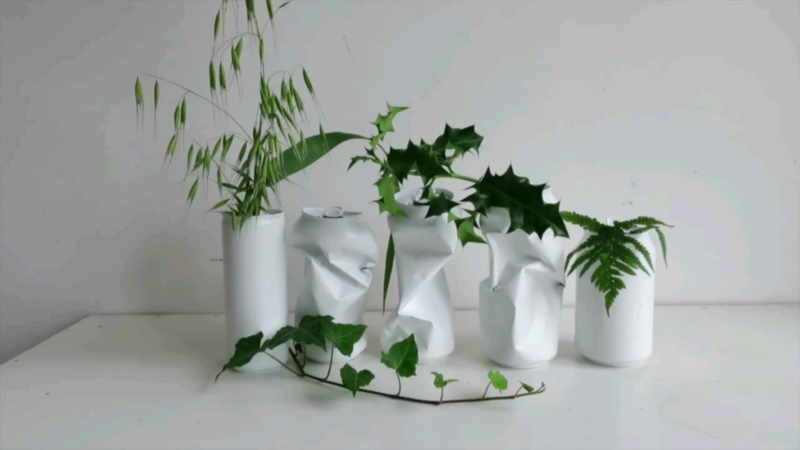 This is a unique planter idea that looks a lot like a minimalist art installation. The bold white with crushed cans is an awesome juxtaposition! Check out the full tutorial from Adam Atkins! 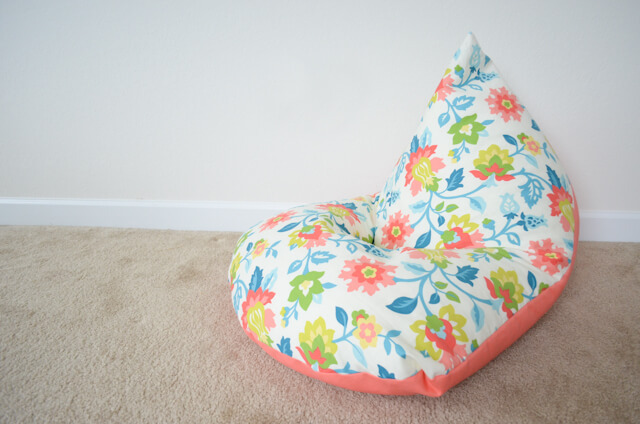 This super cute 30 minute bean bag chair DIY is the perfect seating solution for kids’ rooms! This is a project you can’t miss if you’re looking for cute ideas. Check out the full tutorial from Project Nursery! This is a super cute way to recover old pillows! 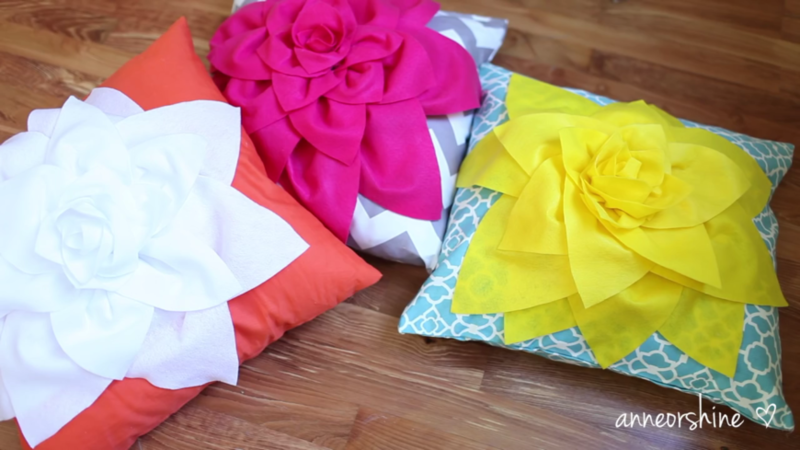 Simply wrap and glue your fabric over pillow forms or old throw pillows! Check out the full tutorial from SoCraftastic! 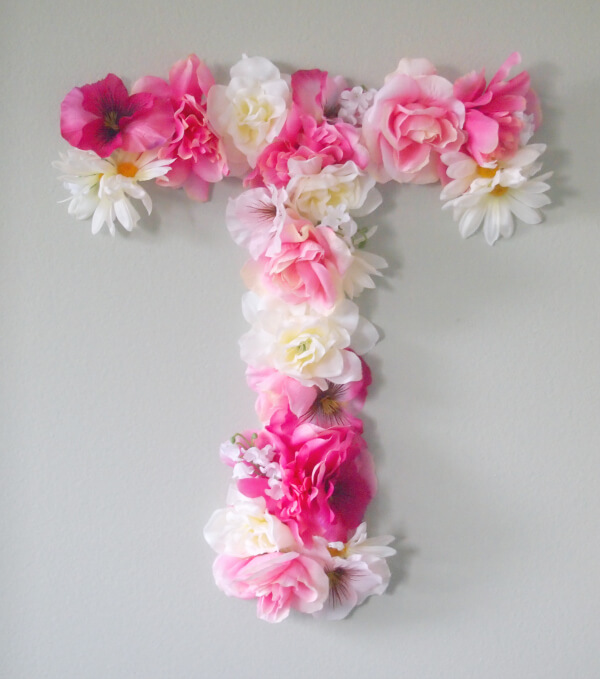 This is an amazing way to create a monogram to hang in your home. 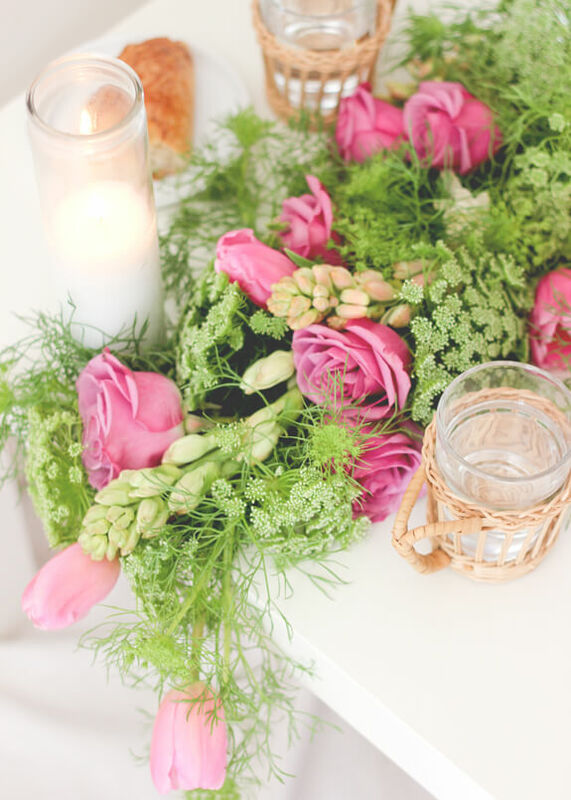 The faux flowers make it perfect for spring! Check out the full tutorial from Decoist! 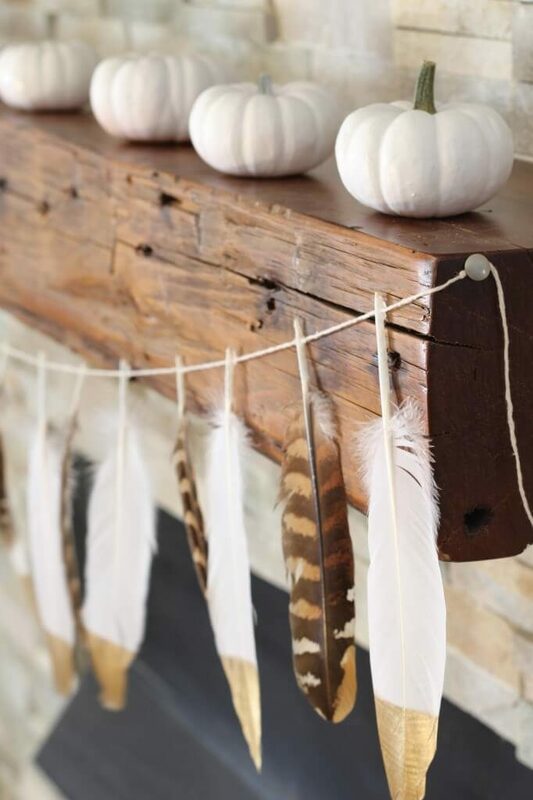 This adorable feather garland would look great hanging on a wall or even across a fireplace. The gold tips are the perfect contrast to the white feathers! Check out the full tutorial from Simple Stylings! This is a great take on the painted feather idea, but using much brighter colors. This project was inspired by Aztec textiles! Check out the full tutorial from DreamWorksTV! This beautiful spring table runner is made with fresh cut flowers and will look stunning as the center of any dinner party design! Check out the full tutorial from Julep! This is an awesome tutorial you’ll come back to every time you want to make your own floral arrangement! 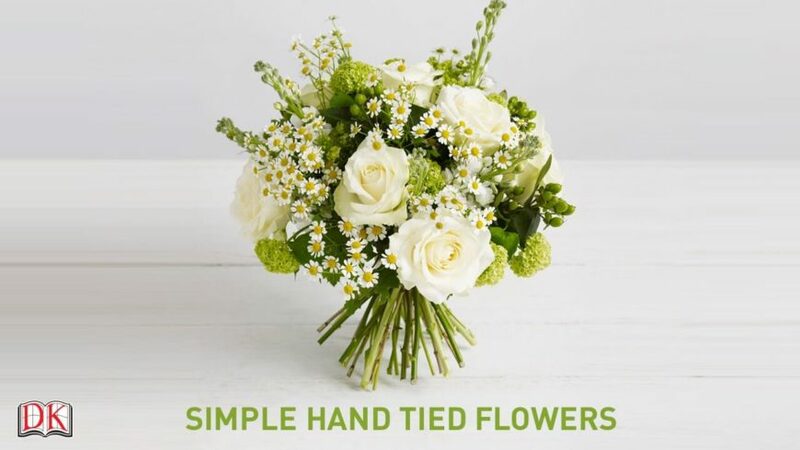 Learn how to create hand-tied bouquets that will make incredible centerpieces. Check out the full tutorial from DK Books! This easy room décor tutorial transforms old picture frames into neat shelving that you’ll want to hang everywhere in your home. Check out the full tutorial from Shanty 2 Chic! 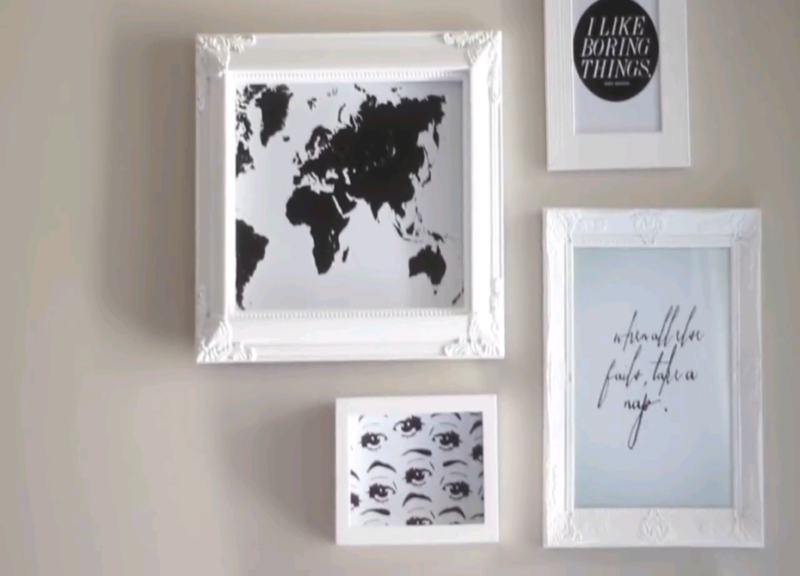 Transform old picture frames into a beautiful gallery wall! Includes tips for mapping out your gallery wall before hanging your pictures! Check out the full tutorial from Carina Stewart!